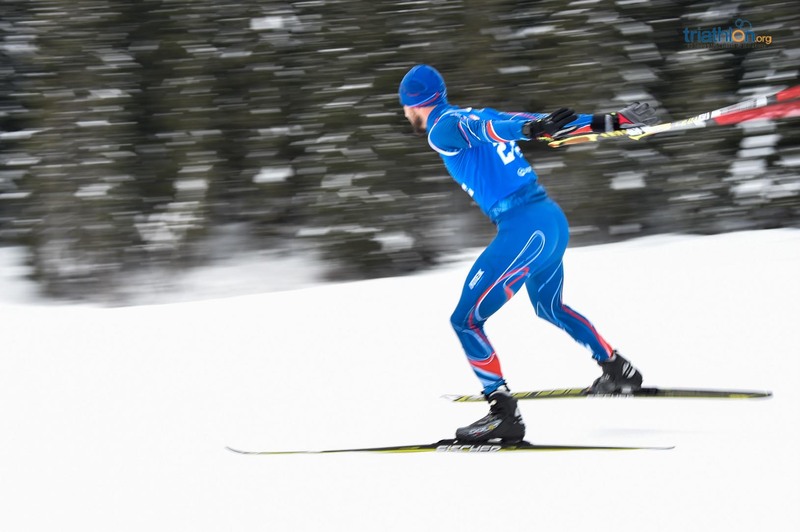 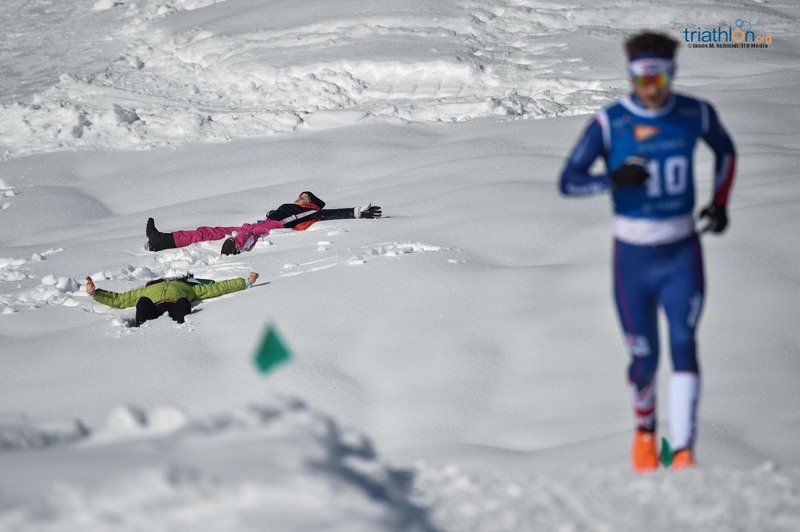 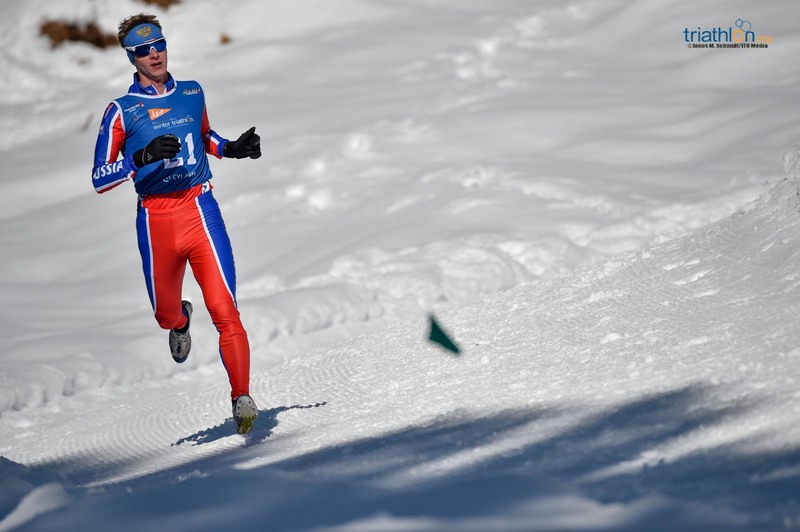 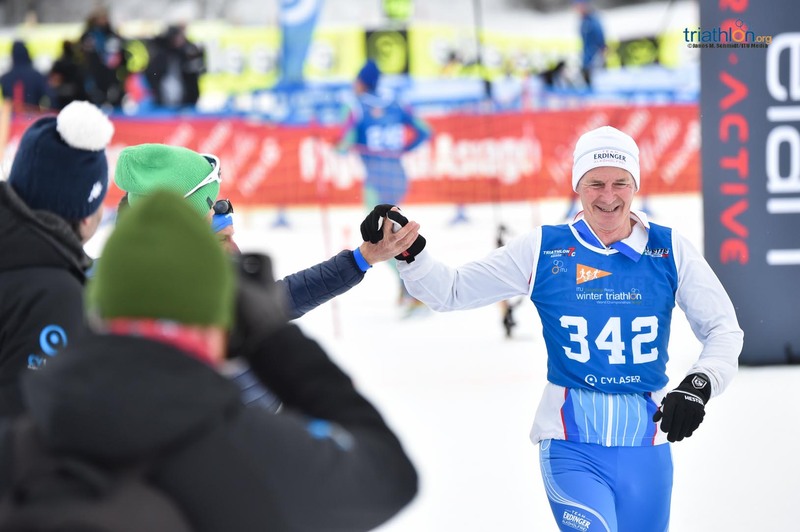 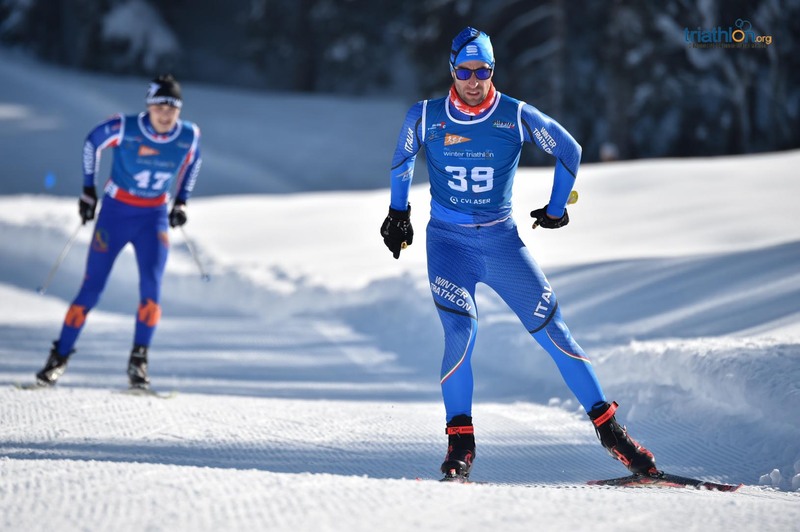 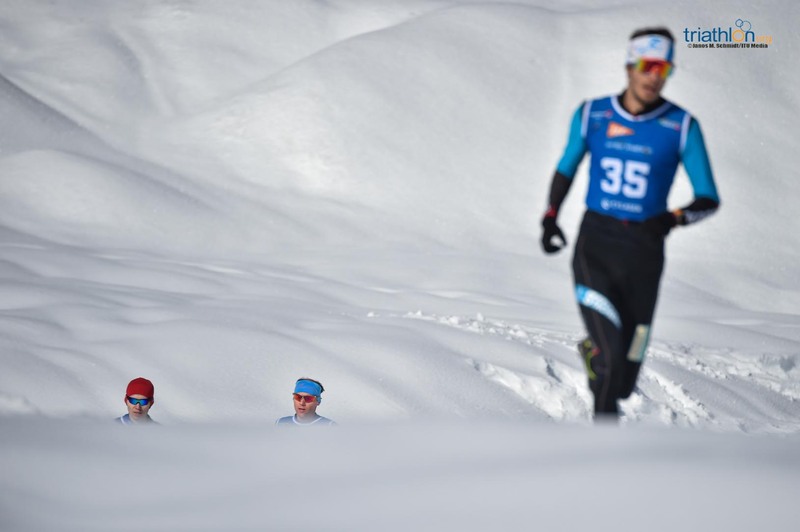 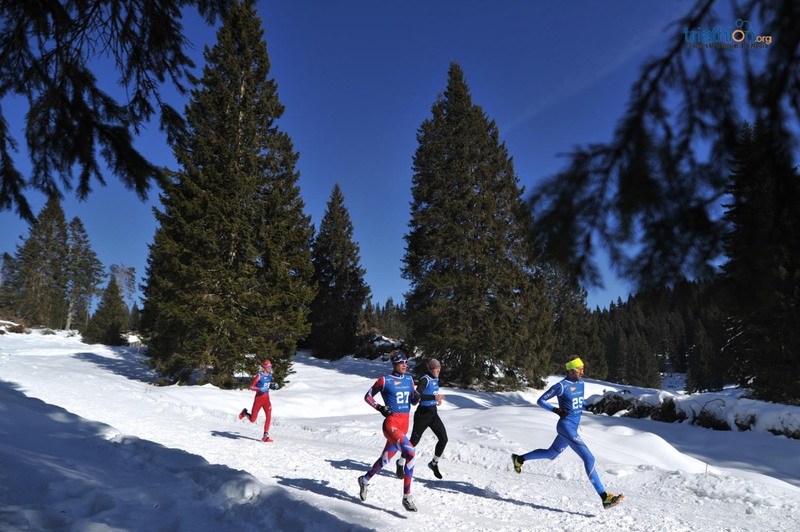 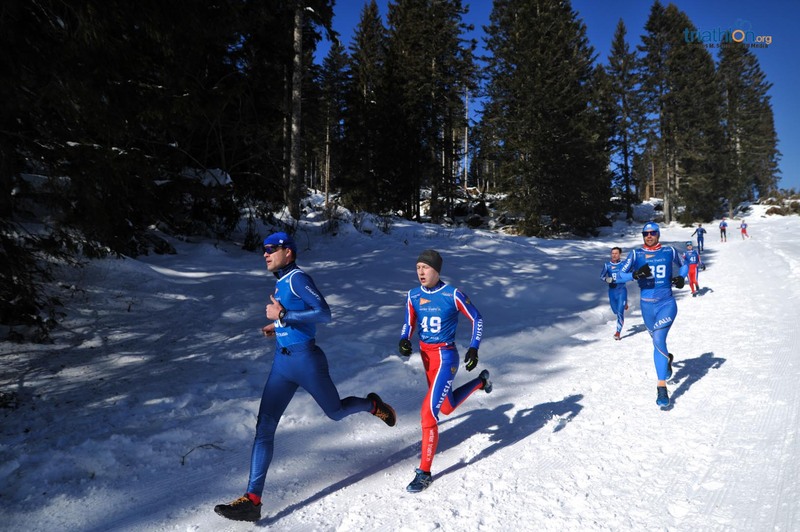 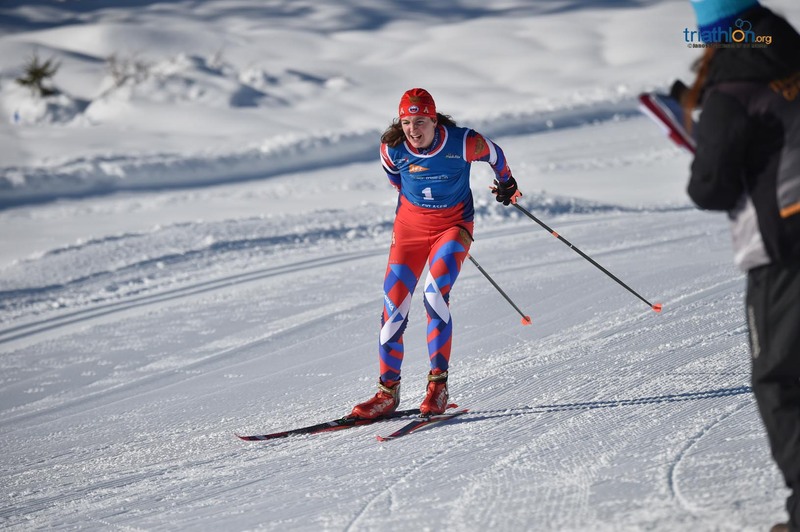 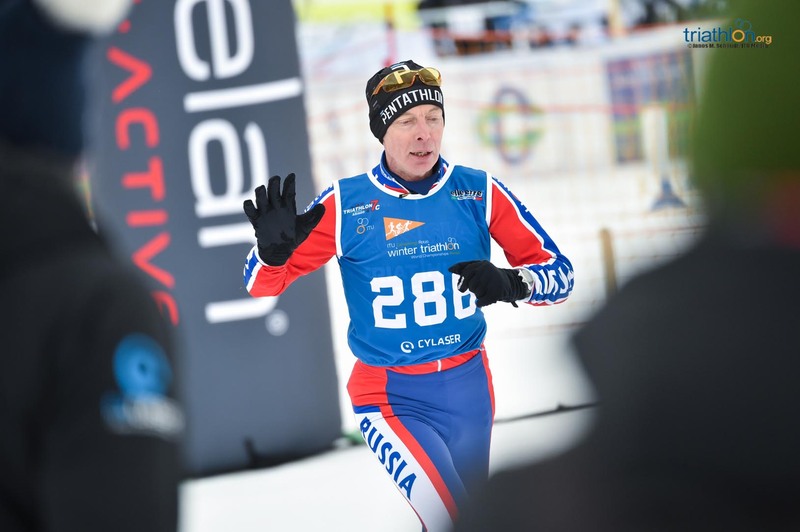 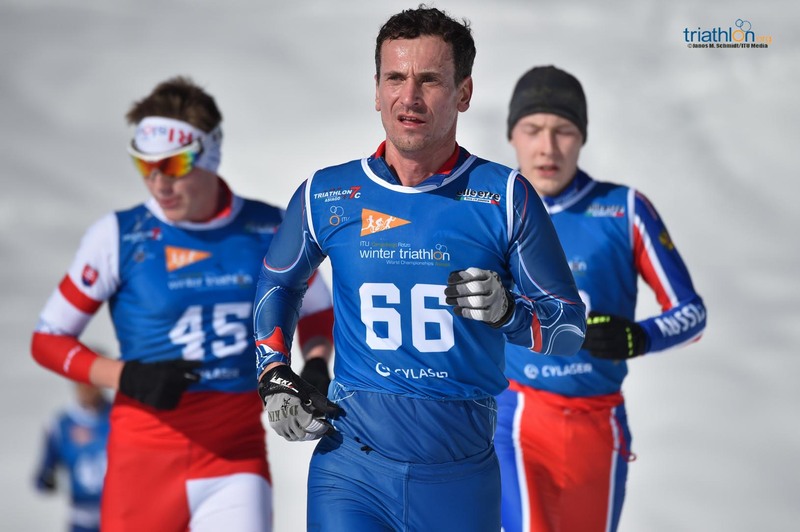 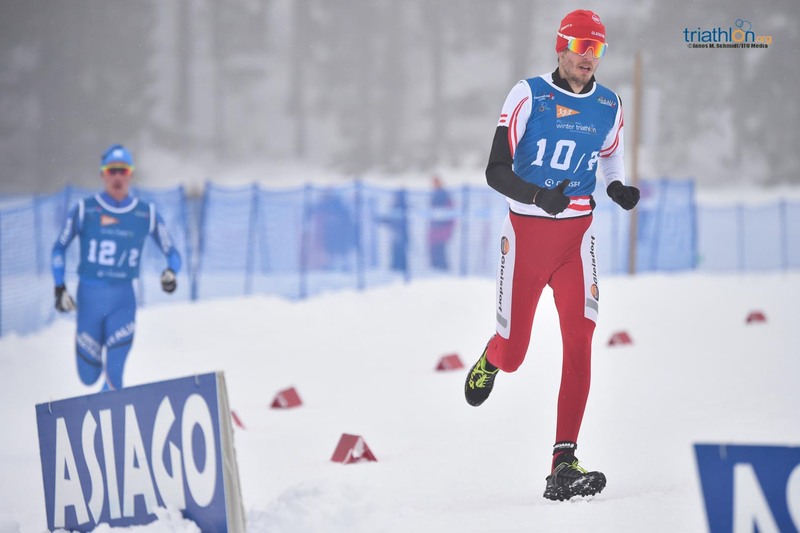 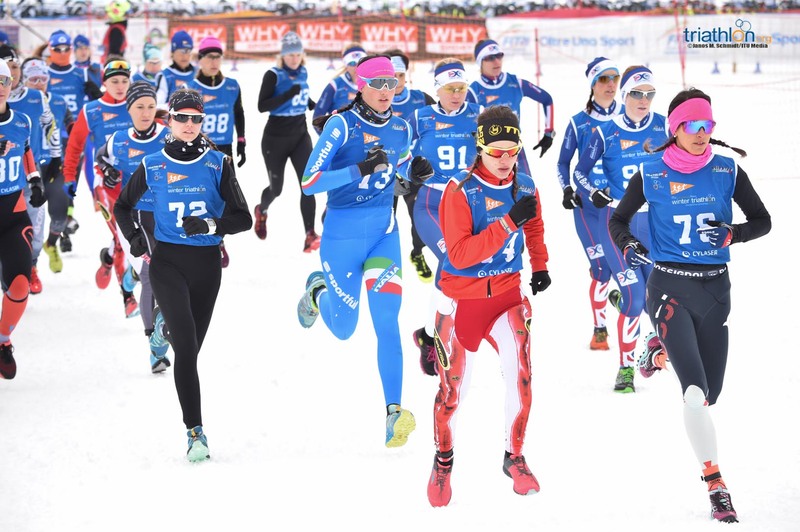 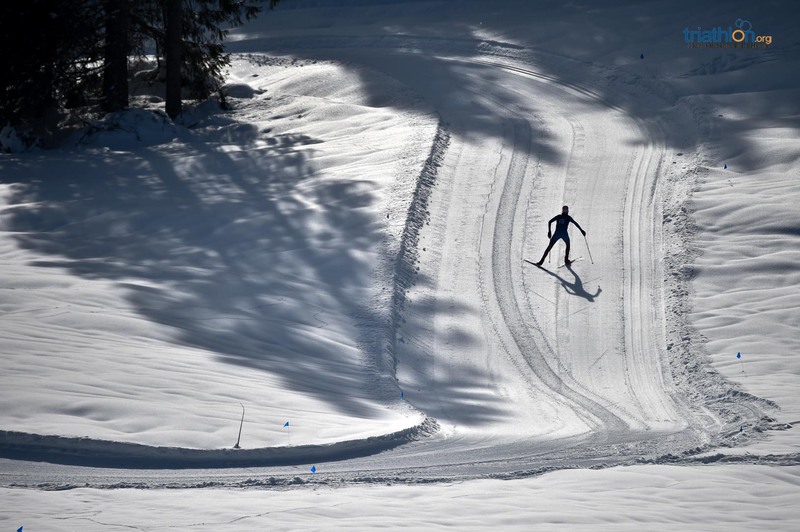 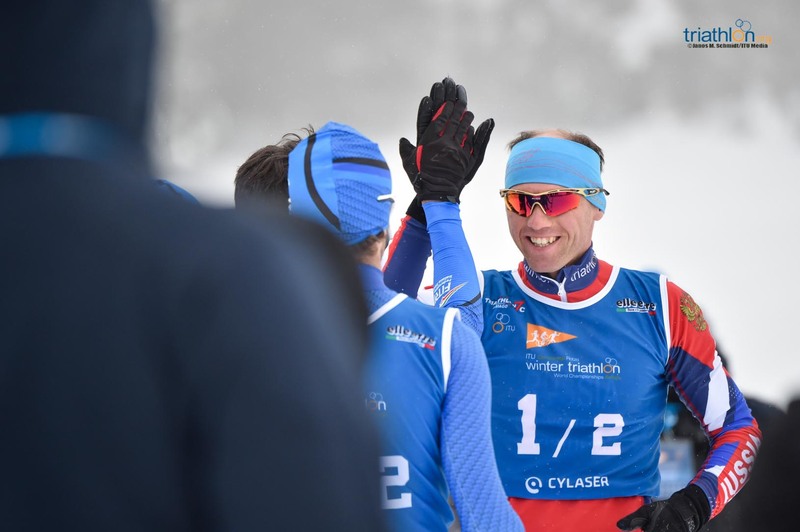 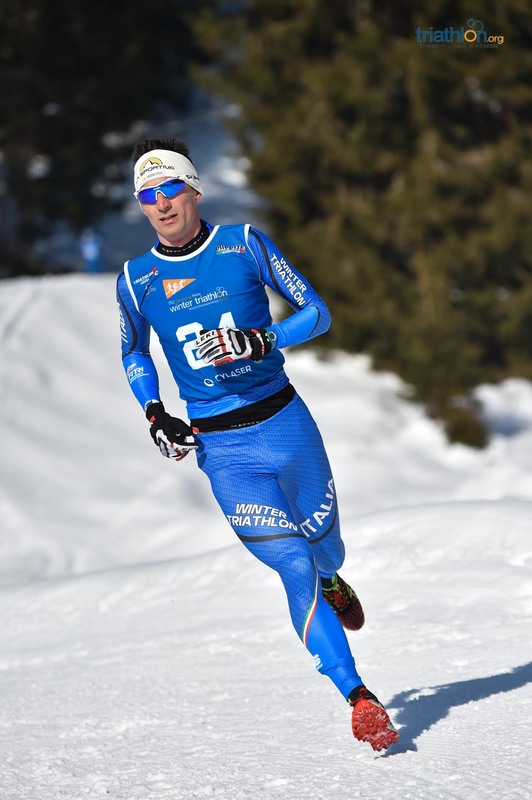 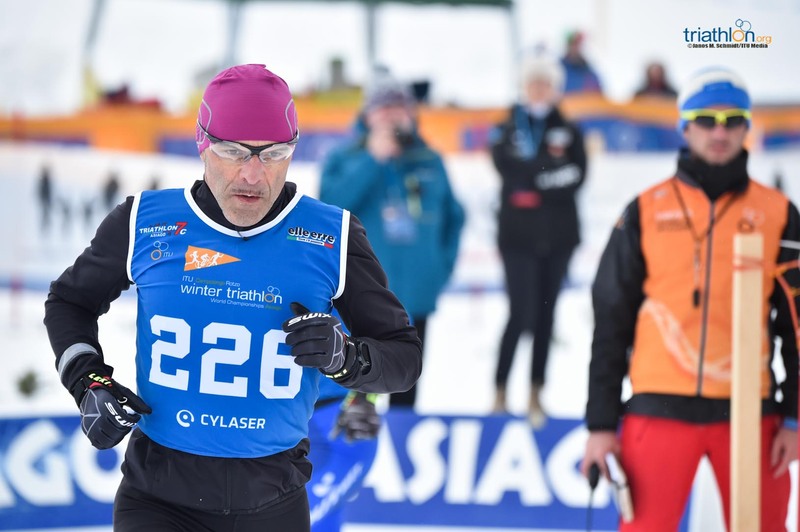 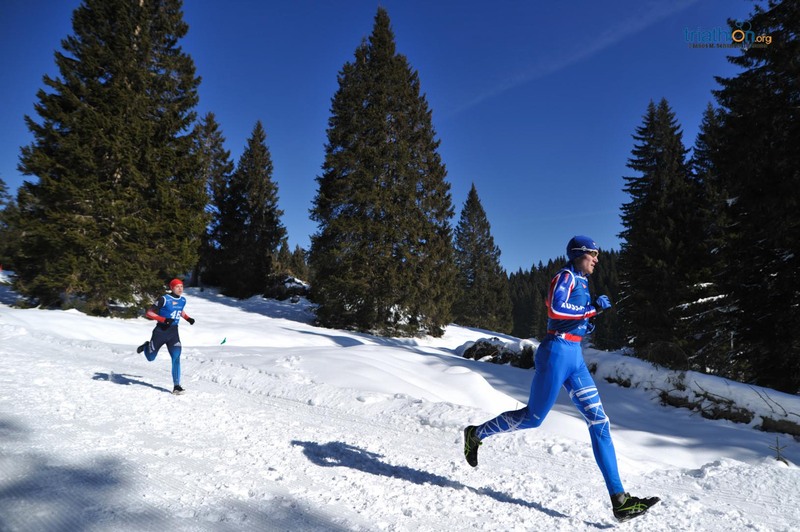 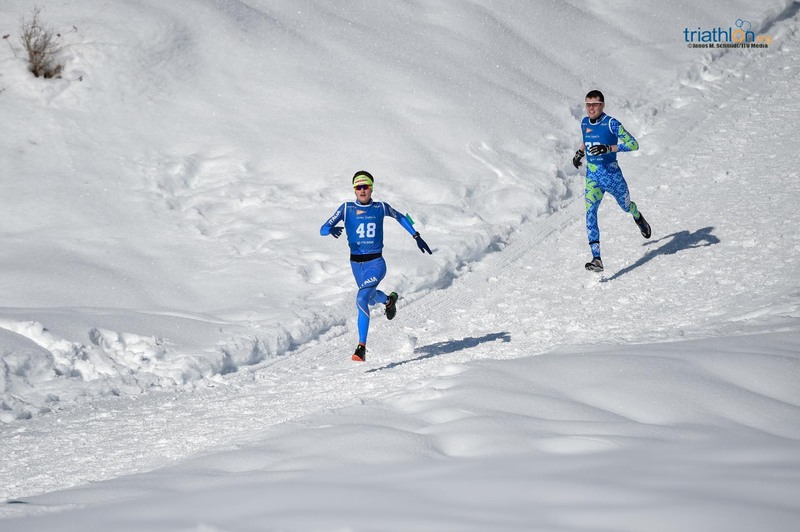 With the thermometer hitting minus 12 degrees Celsius and under a clear sky in the Italian Altipiano of Asiago, the Russian team once again showed the world that they are the country to beat when it comes to winter triathlon. 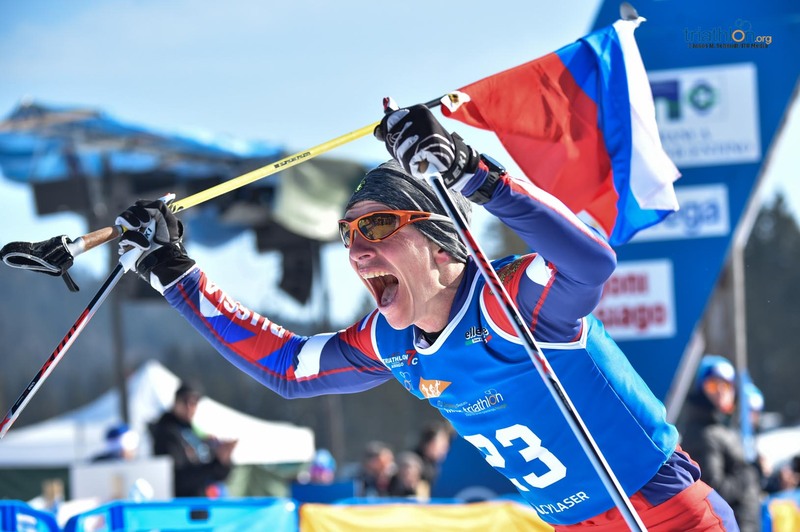 Pavel Andreev (RUS) claimed his seventh world title in a dominant performance, while compatriot Daria Rogozina, still an U23 athlete, was the surprise of the day, claiming not only the U23 world crown, but also the Elite. 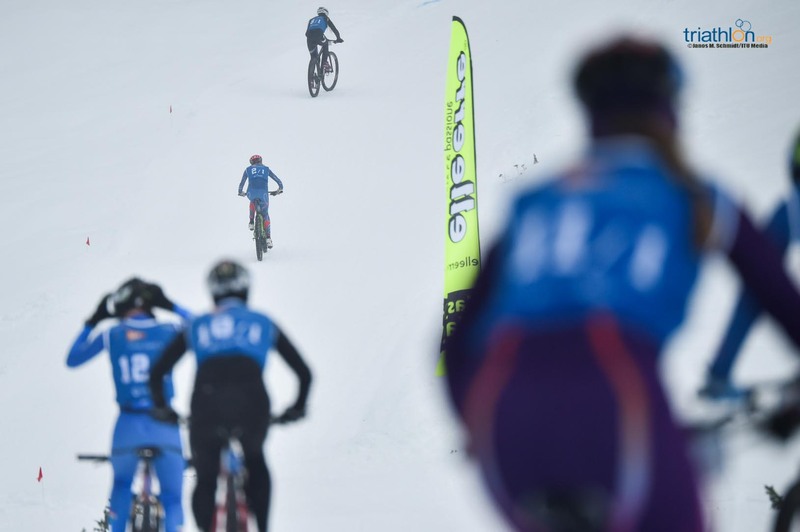 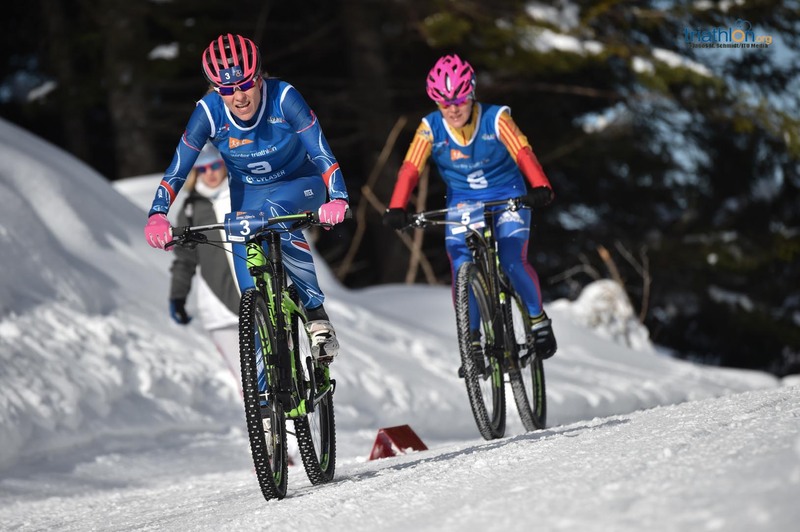 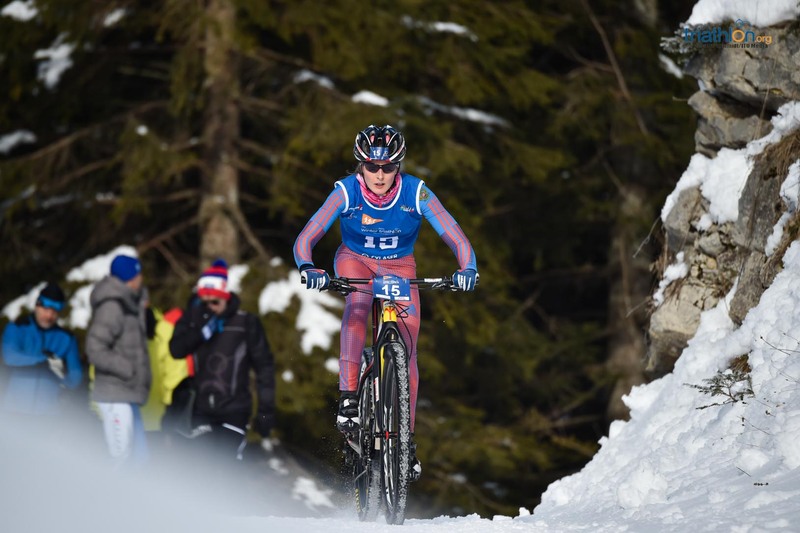 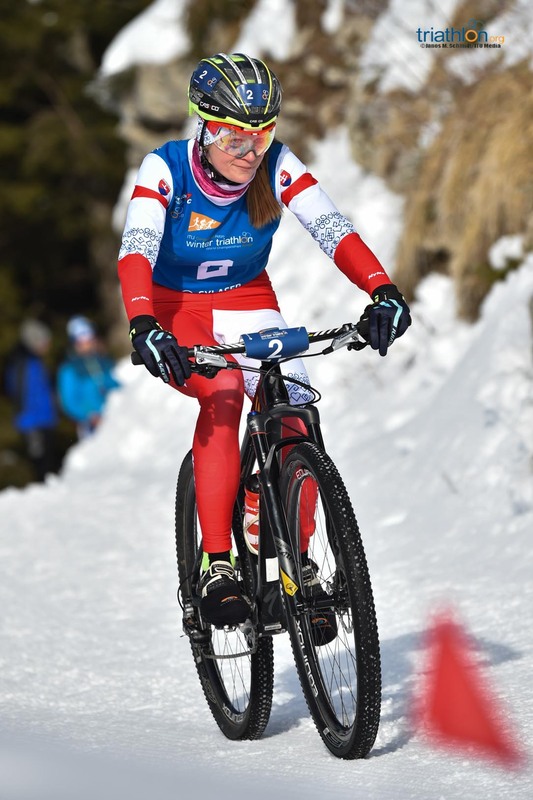 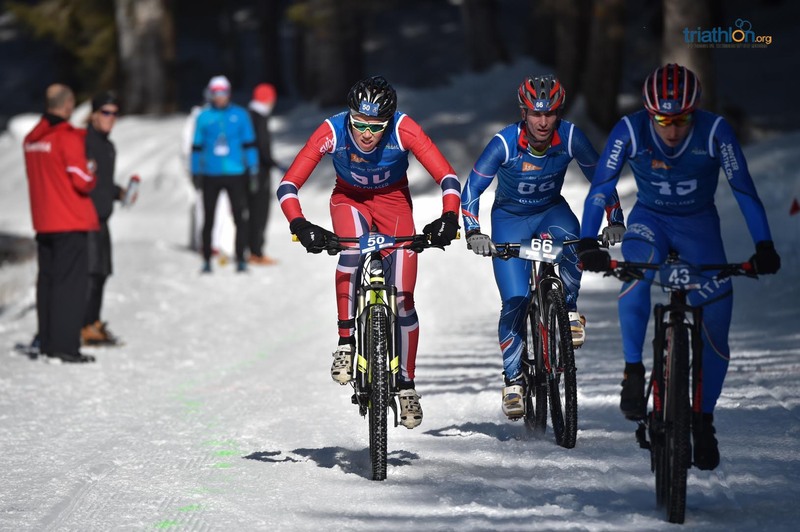 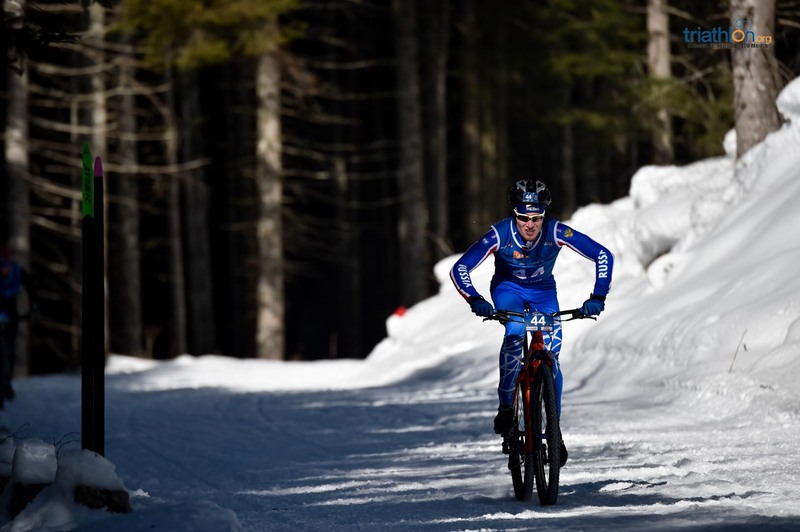 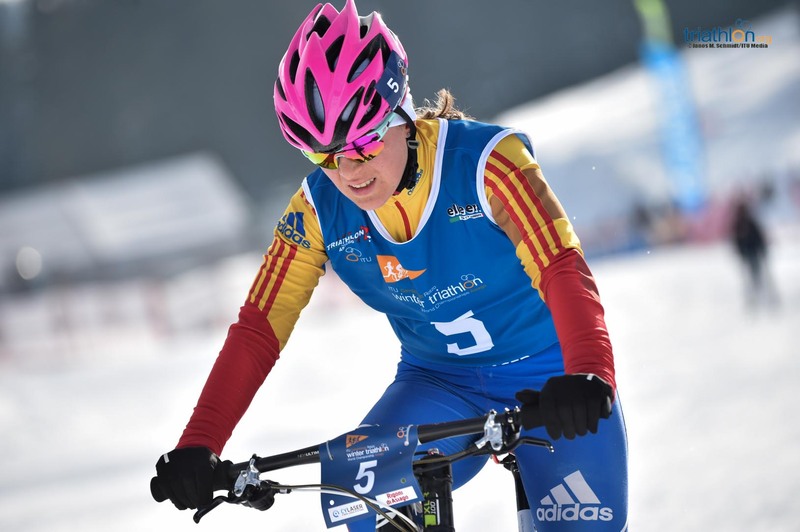 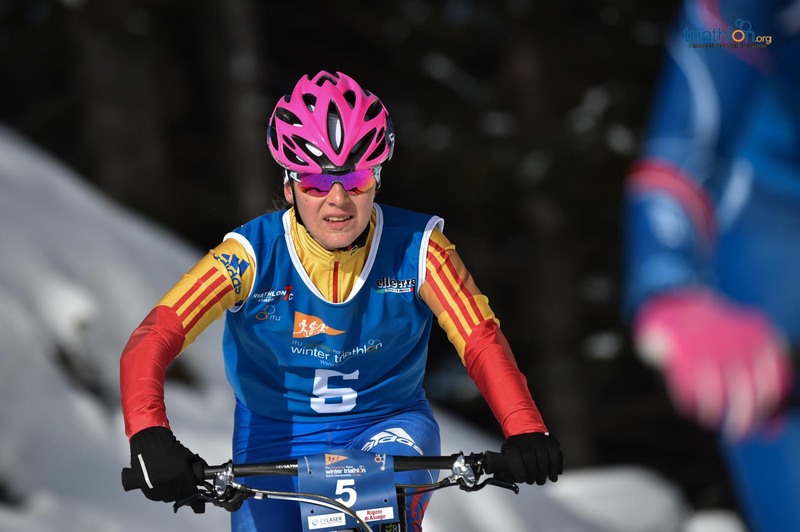 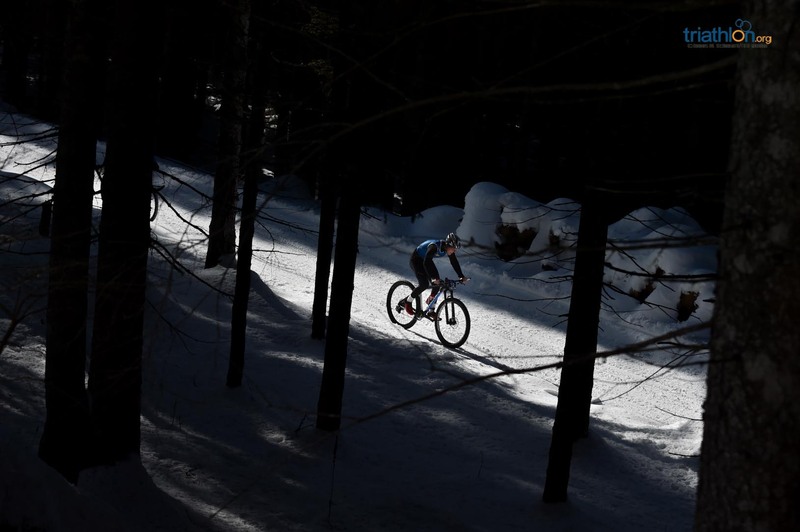 The Elite and U23 women were the first to taste the hard and technical Asiago course, and with a start planned at 9am and the temperatures way below zero, the bike course was in perfect condition. 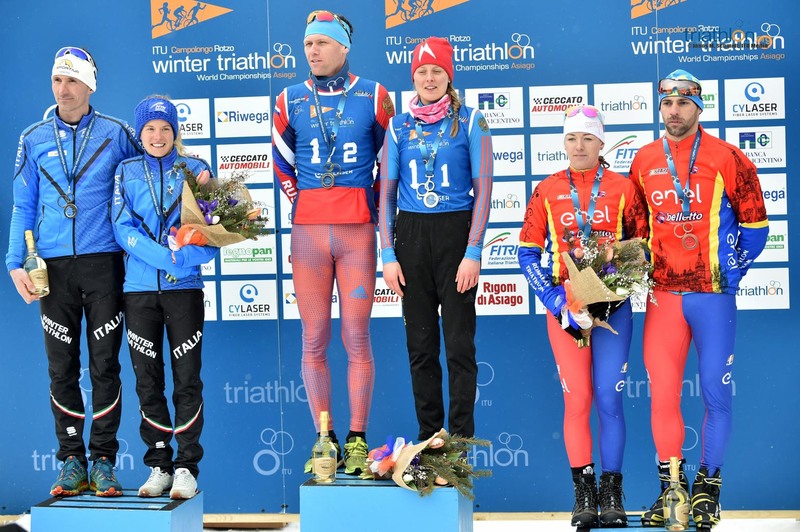 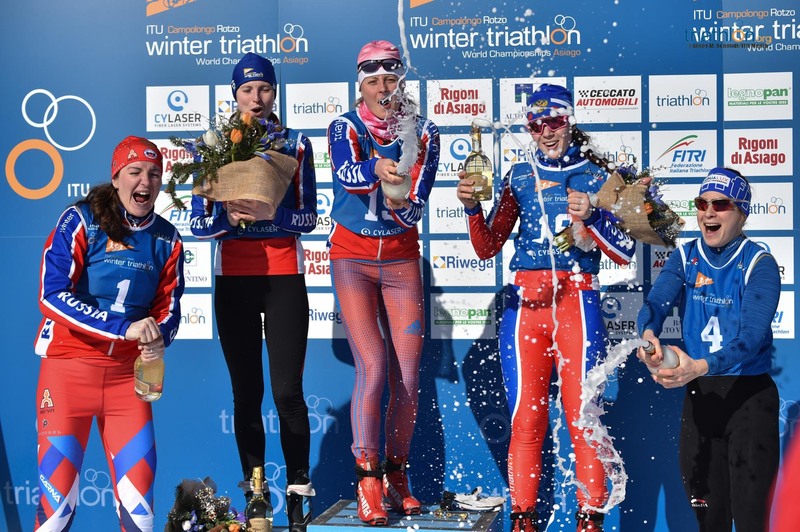 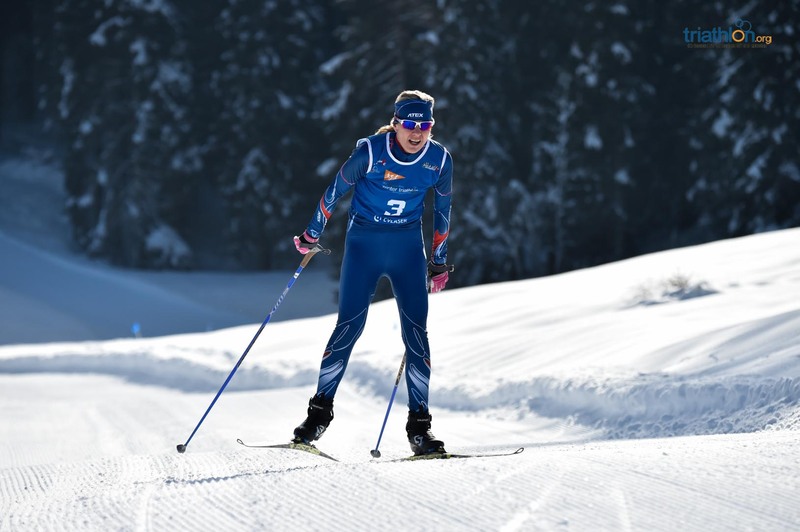 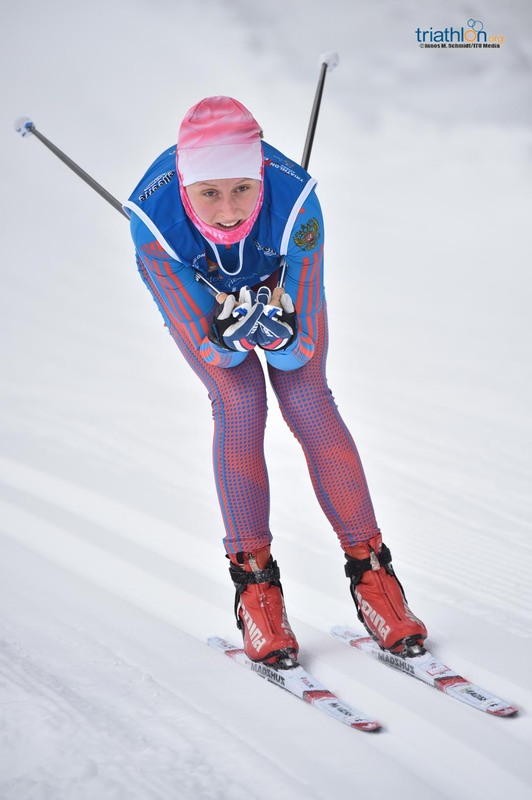 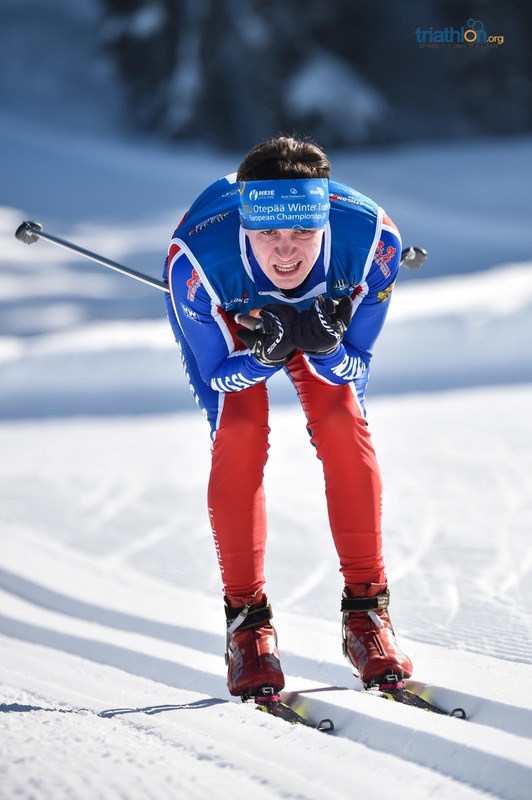 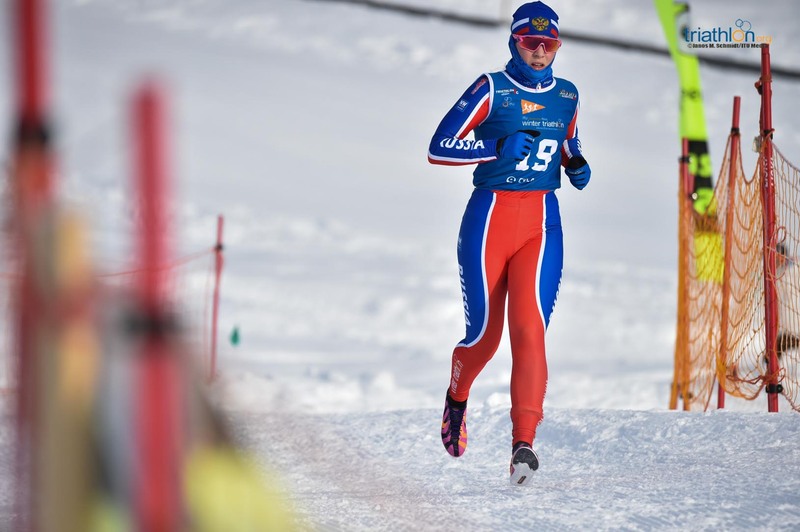 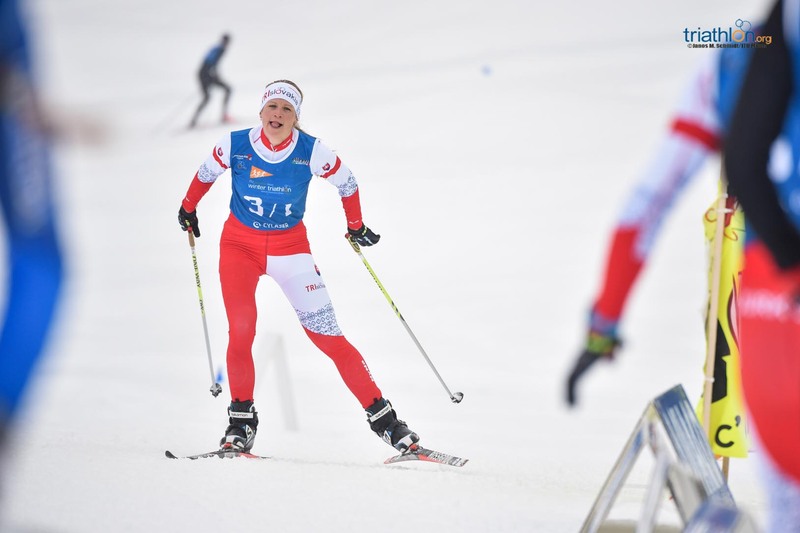 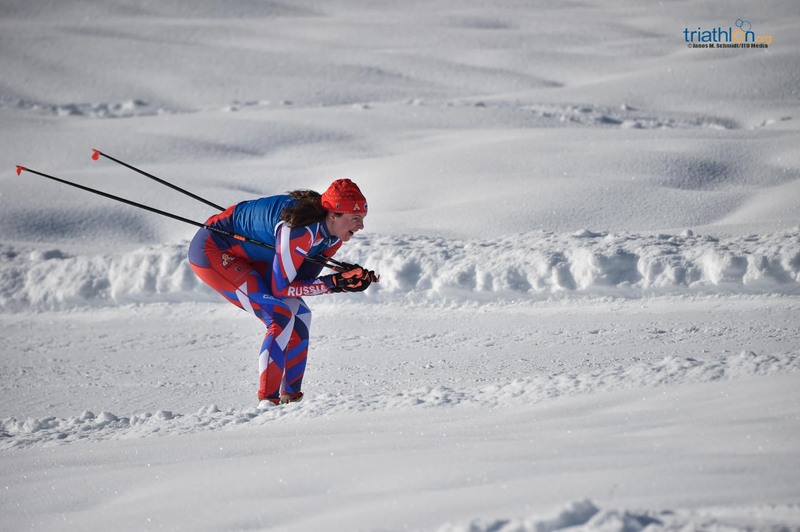 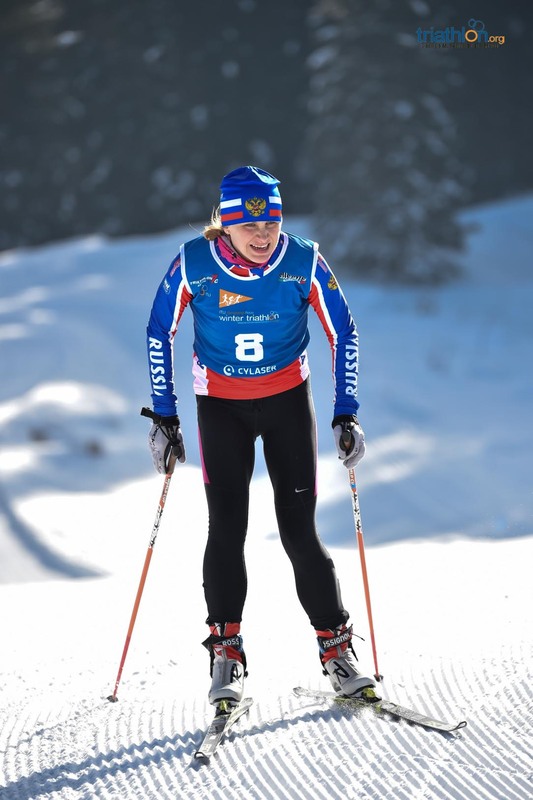 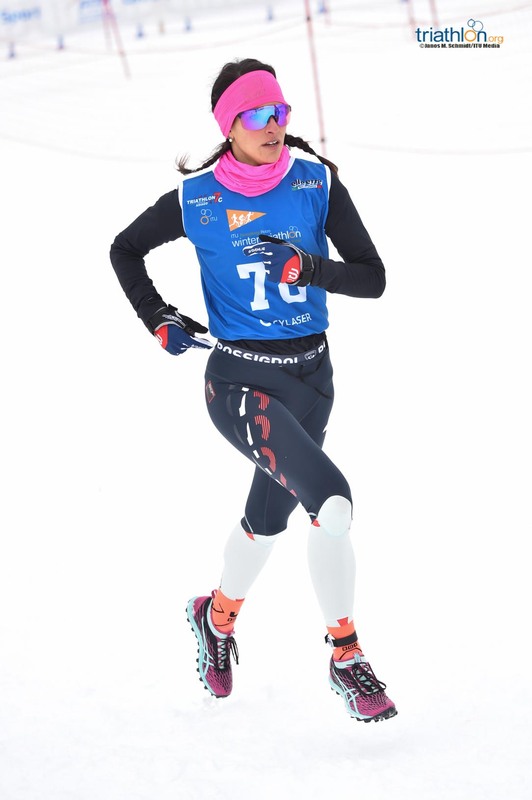 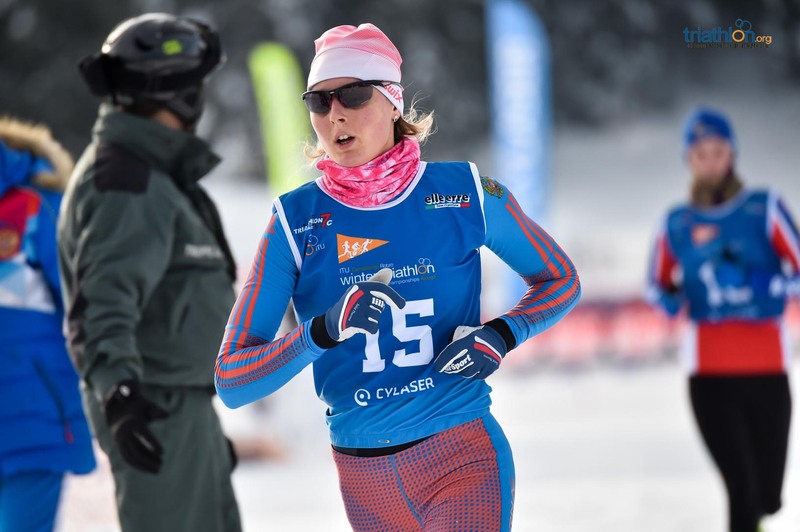 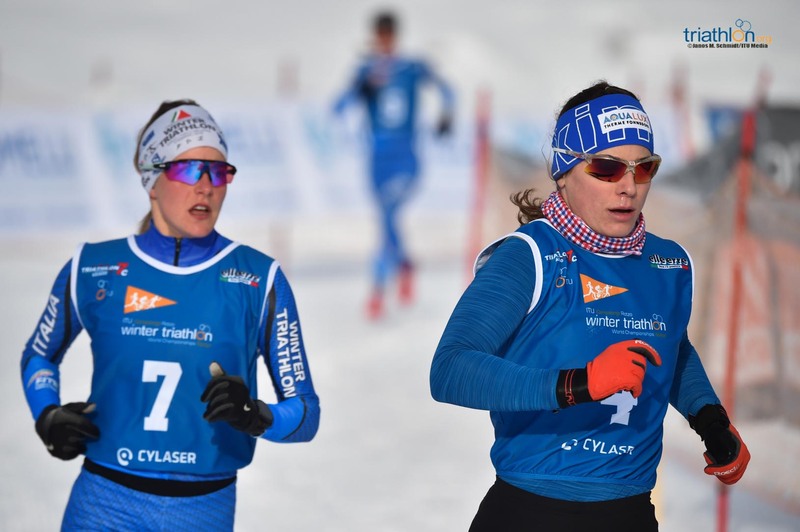 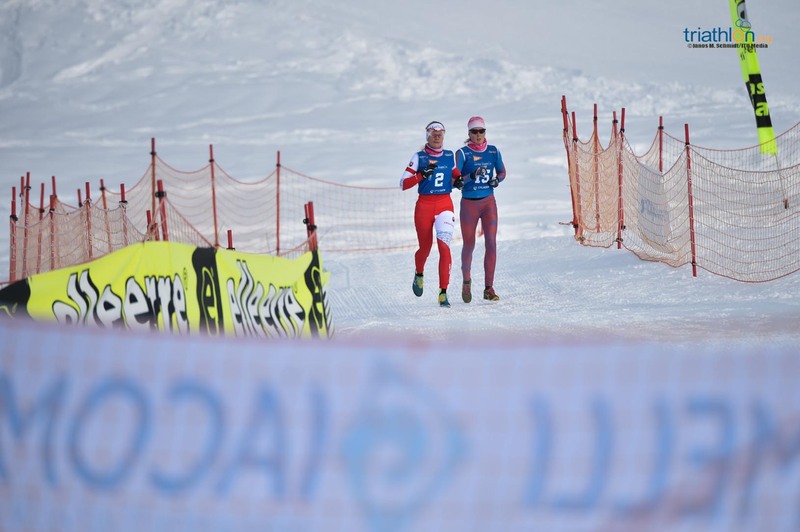 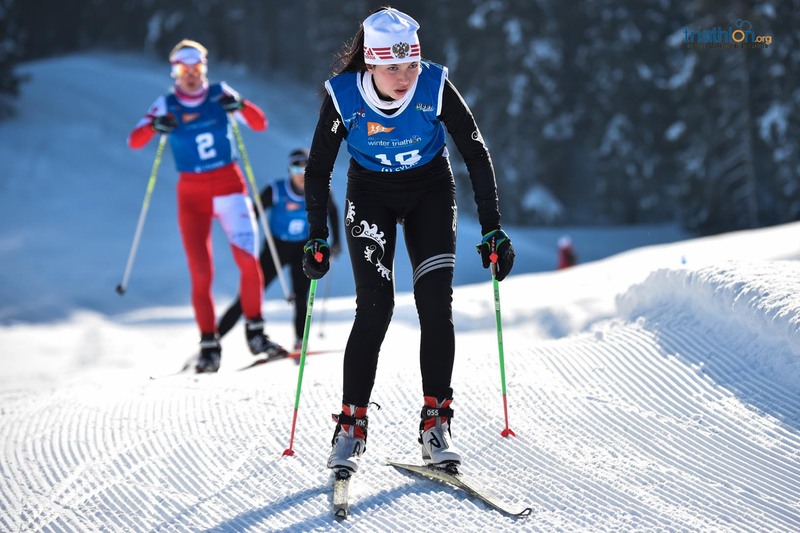 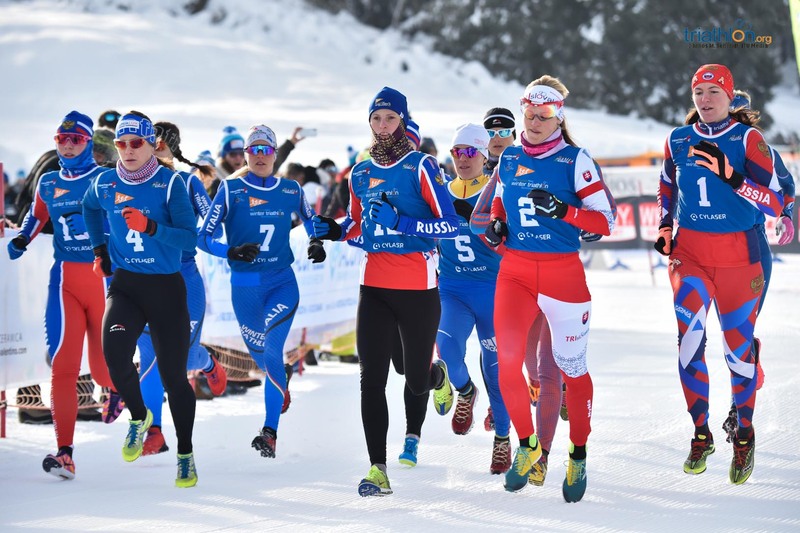 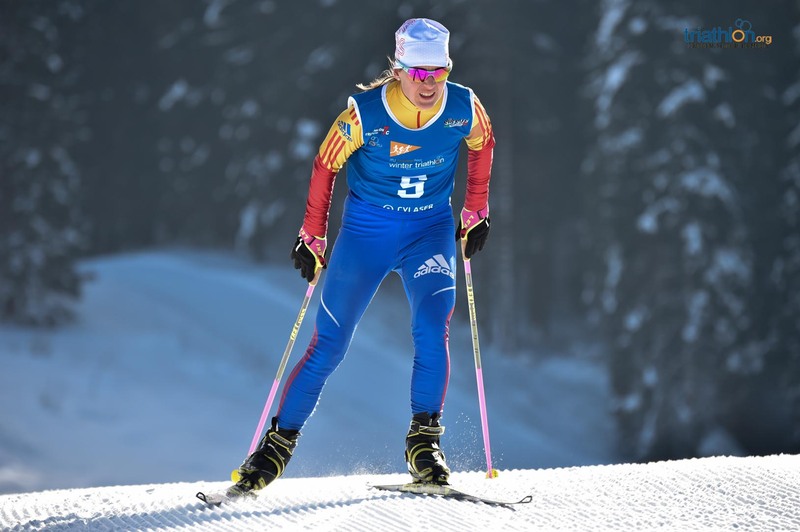 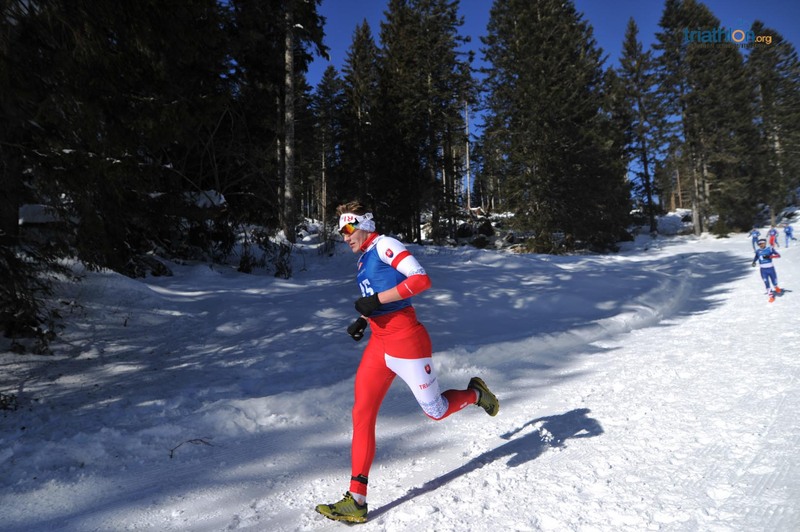 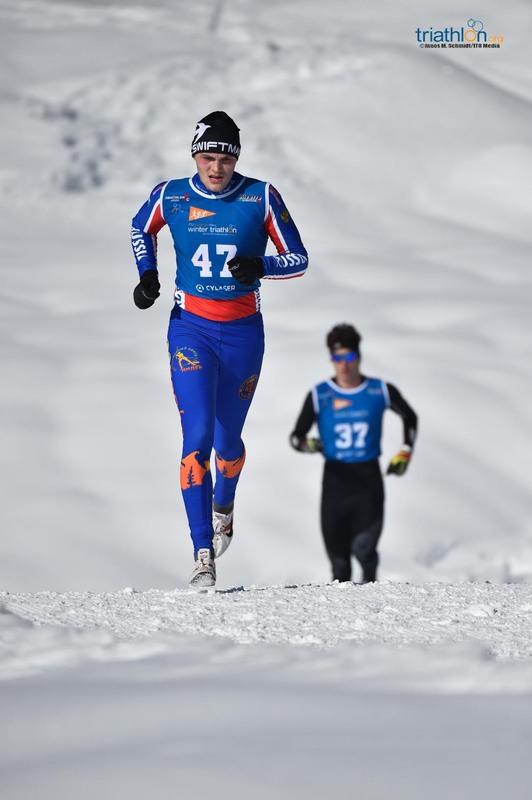 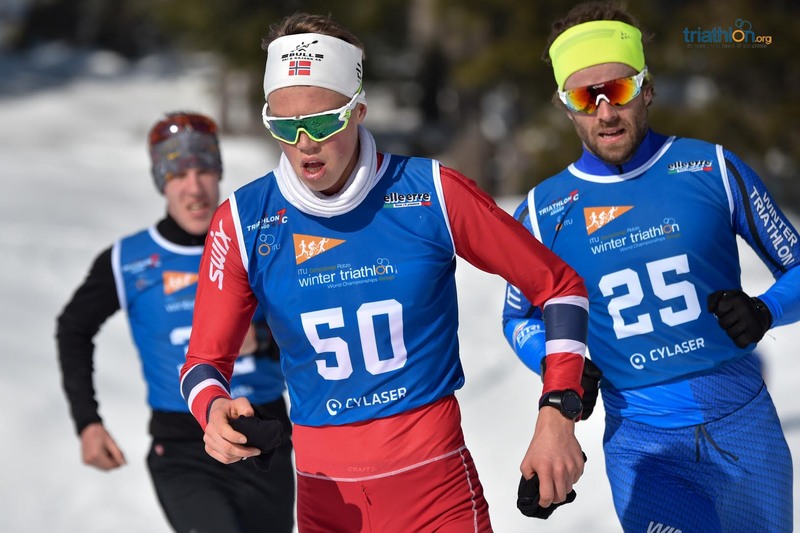 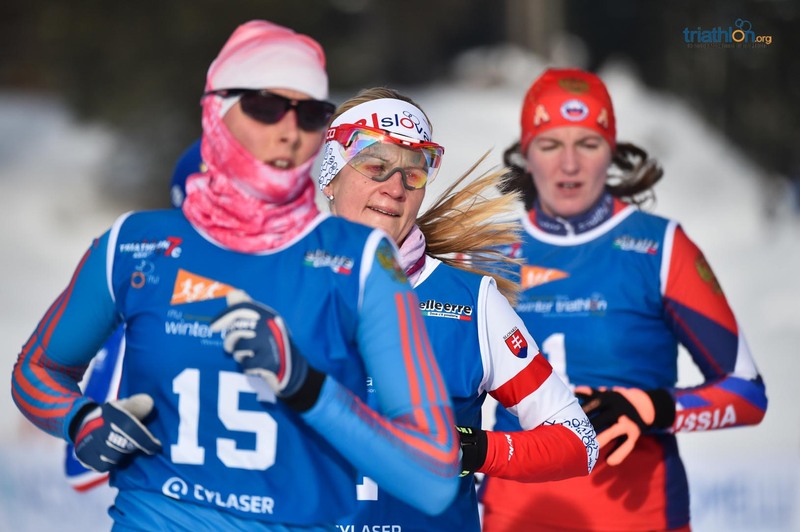 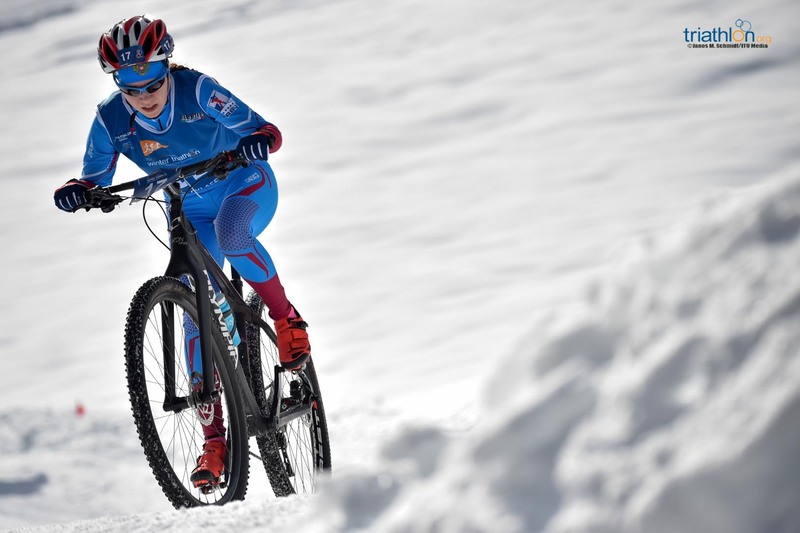 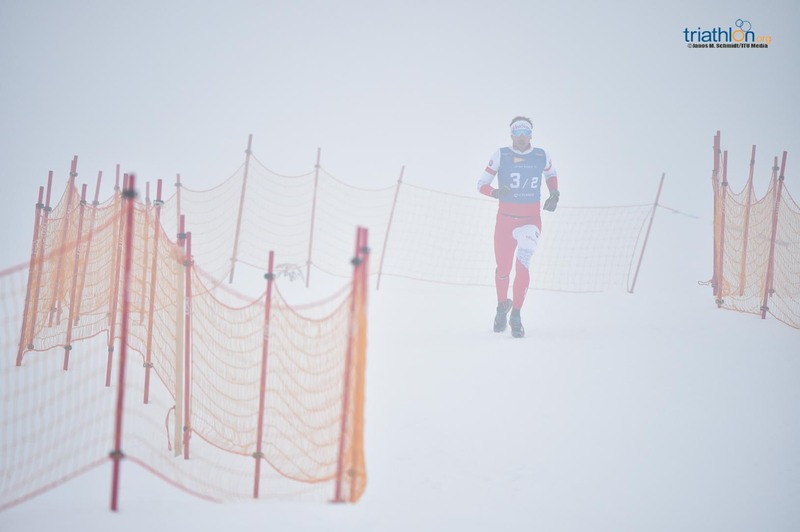 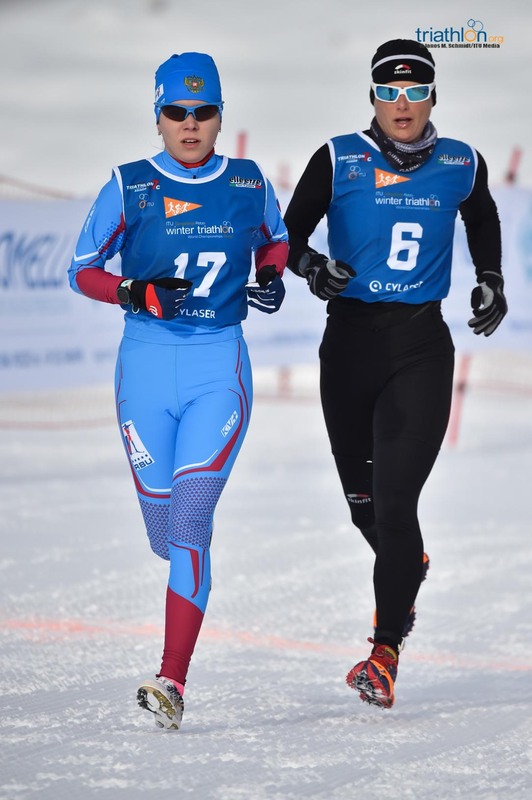 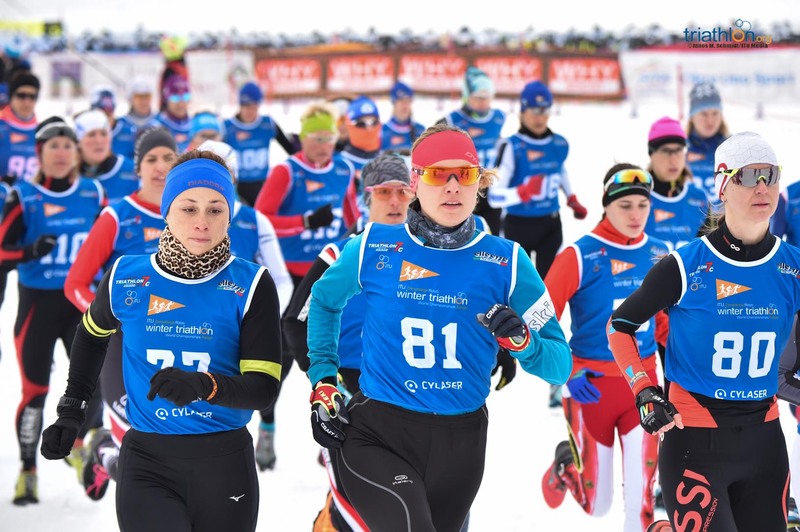 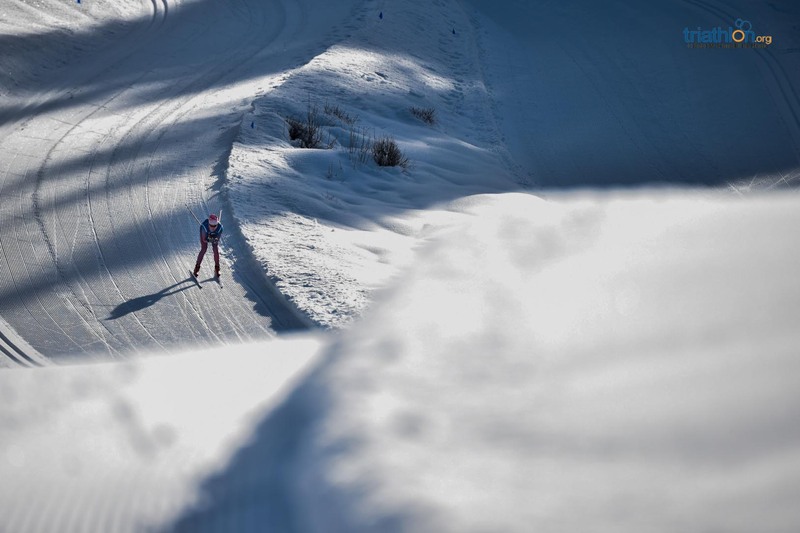 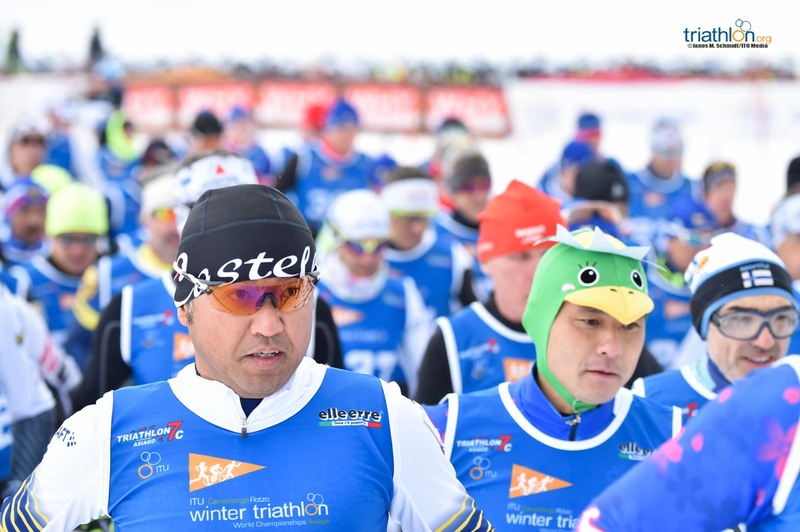 It was from the very first kilometres of the run leg, however, that the young Russian Rogozina proved that she was going to be a tough challenge for the ‘winter triathlon queen’ Yulia Surikova (RUS). 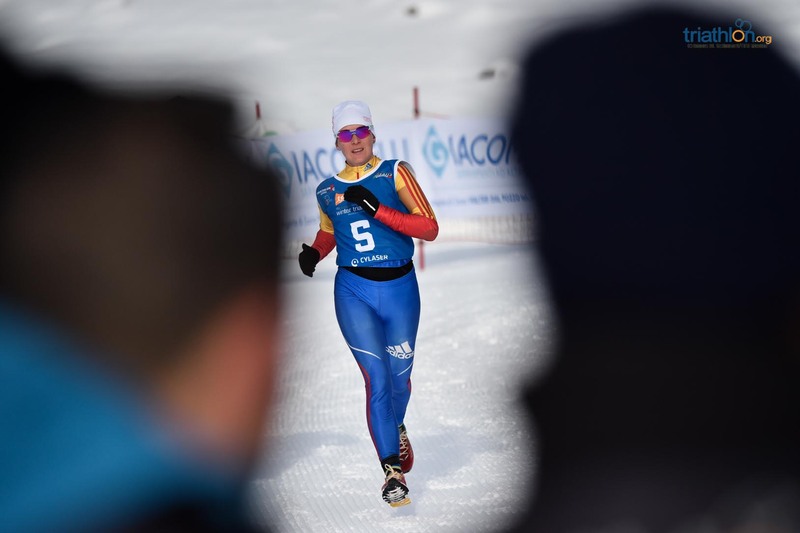 Halfway through the 8km run, Rogozina, Kristina Lapinova (SVK) and Nadezhda Belkina (RUS) already had more than 20 seconds over the reigning double world champion Surikova, and that distance only kept increasing lap after lap. 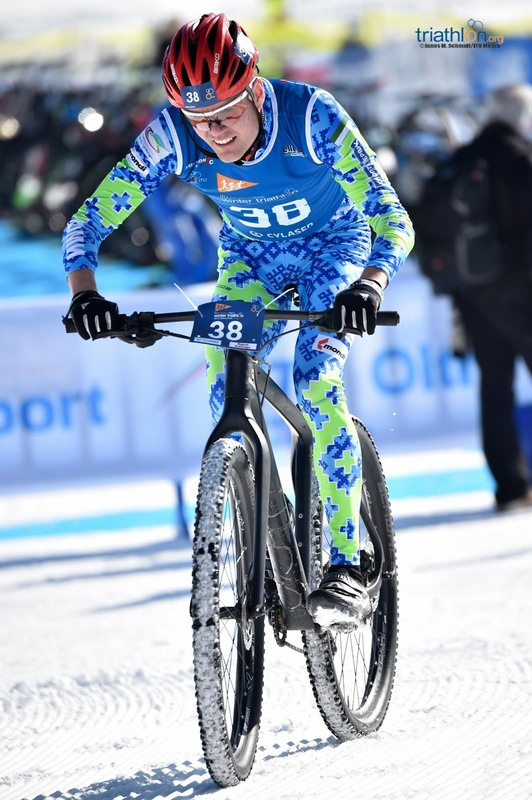 By the time the athletes finished the run to get onto the bikes, Surikova was almost 90 seconds off the three leaders. 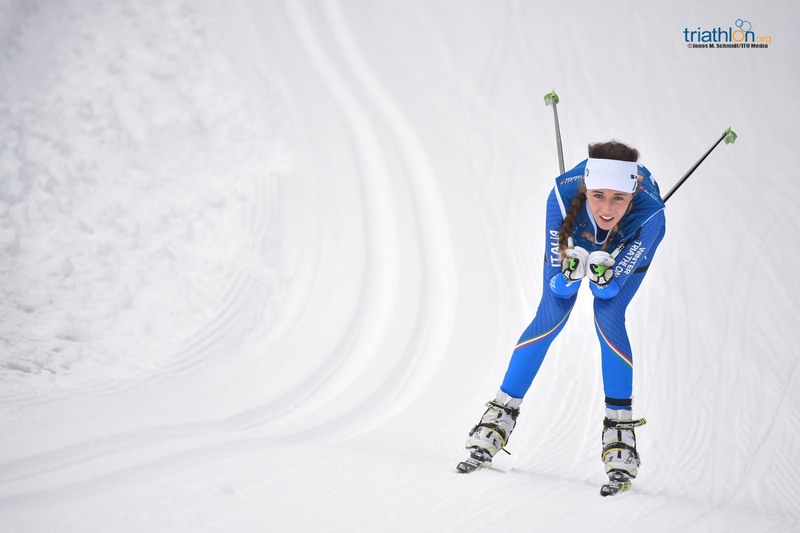 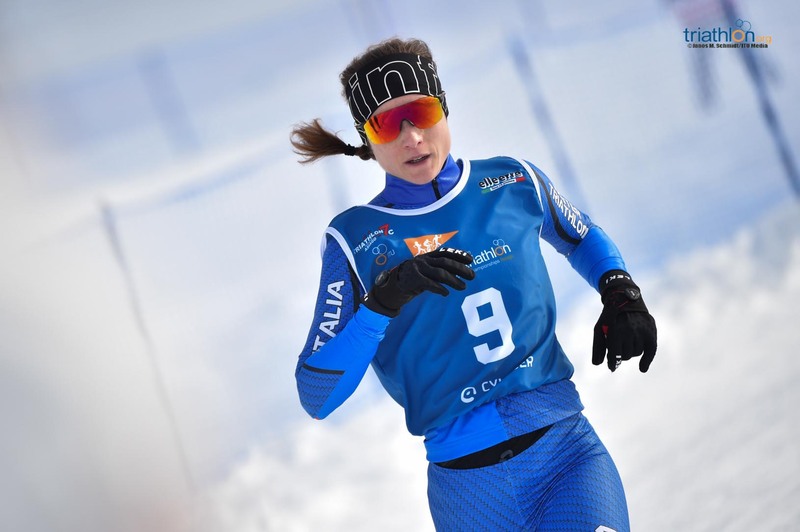 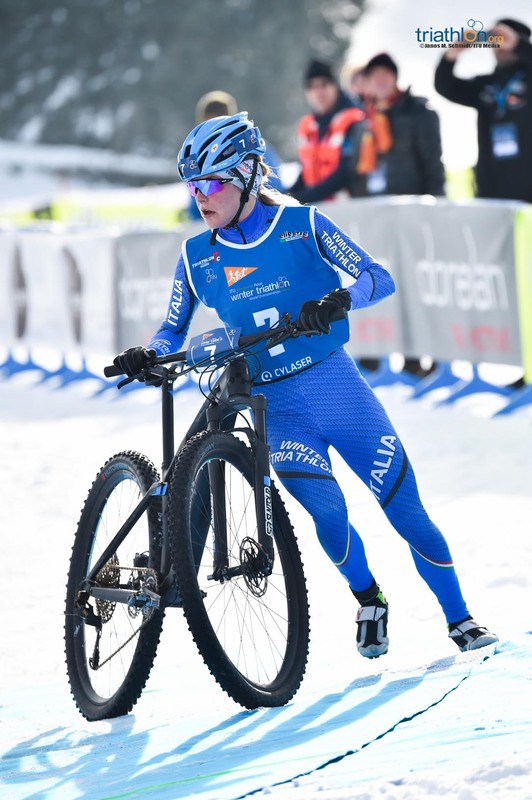 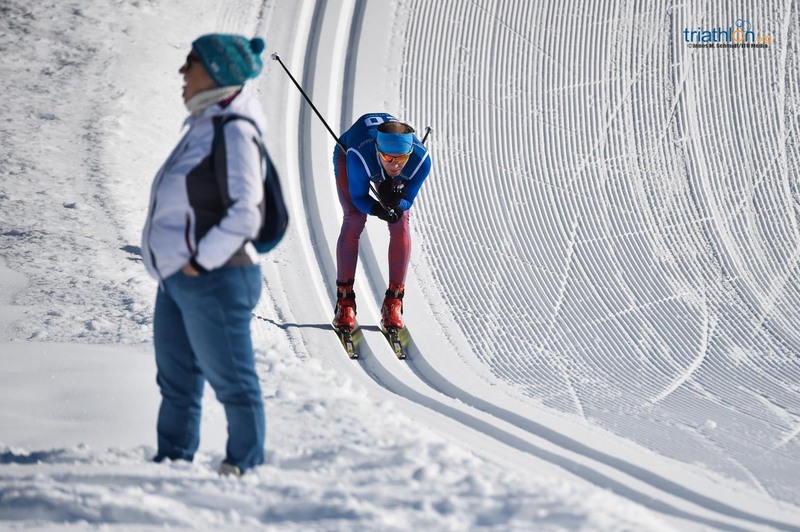 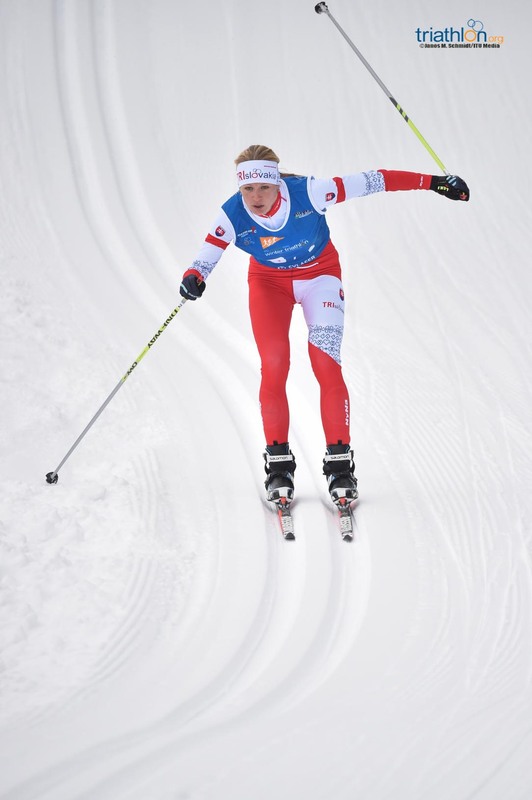 Behind her, and supported by the local crowds, Italian Sandra Mairhofer was also flying in the snow. 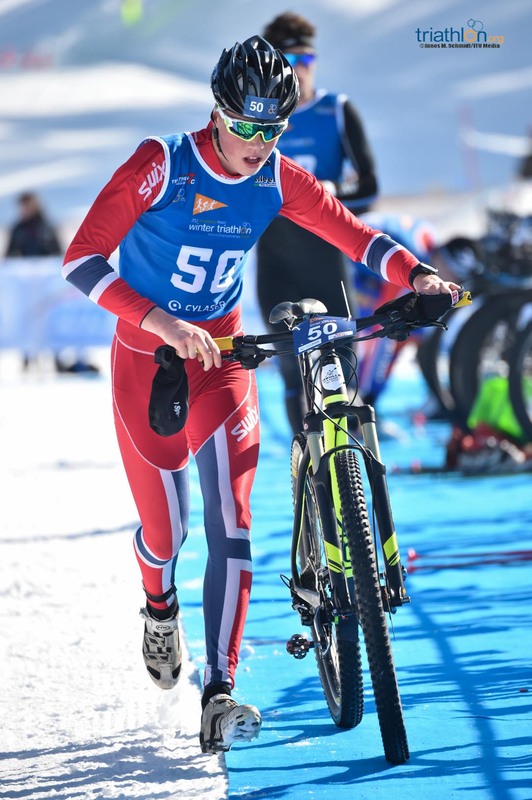 But the tough and very technical course ended up being an advantage for the likes of Surikova, used to race in cross triathlon events, and who showed her strength to mark the best split of the day on the bike, completing the 14km in a little over 34 minutes. 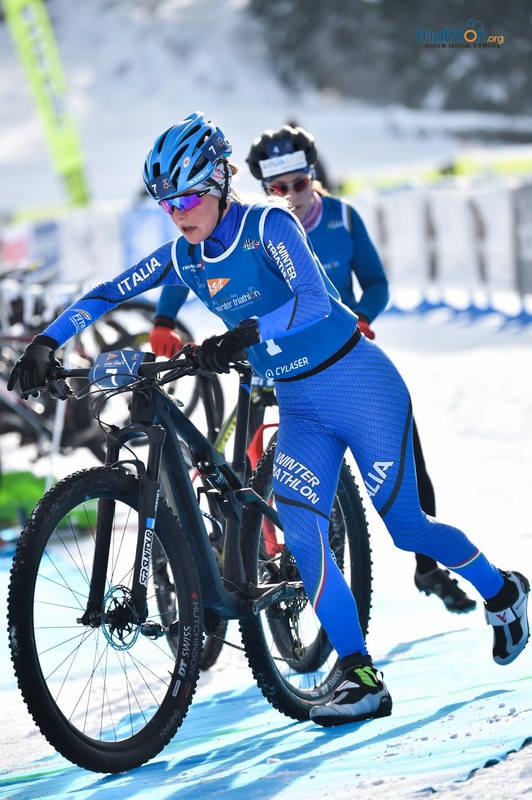 It was not enough to catch up with Rogozina, though, who rode by herself throughout the MTB course to reach the second transition alone, with almost a minute over the chasers. 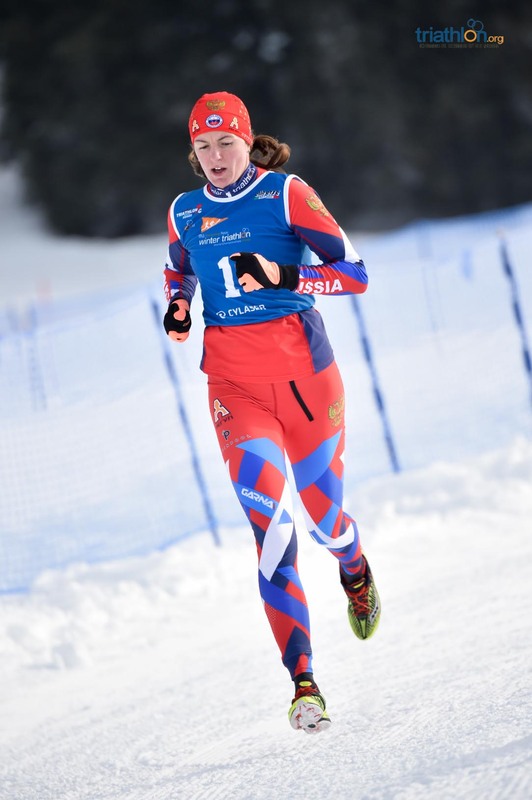 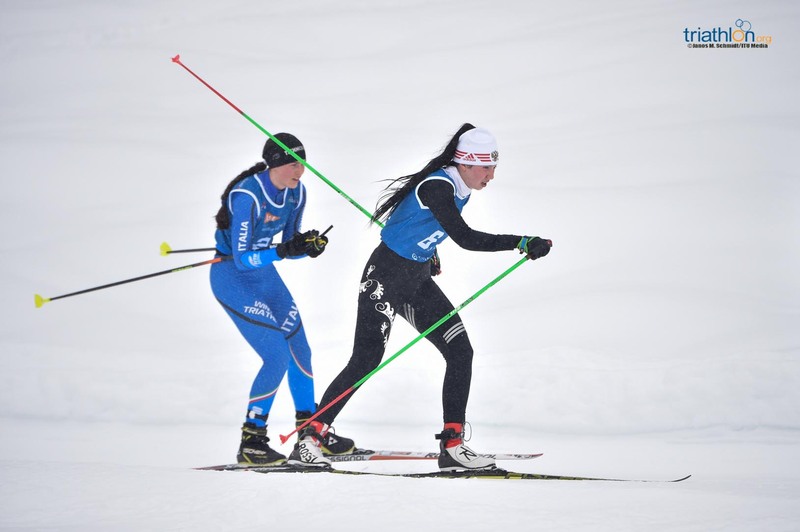 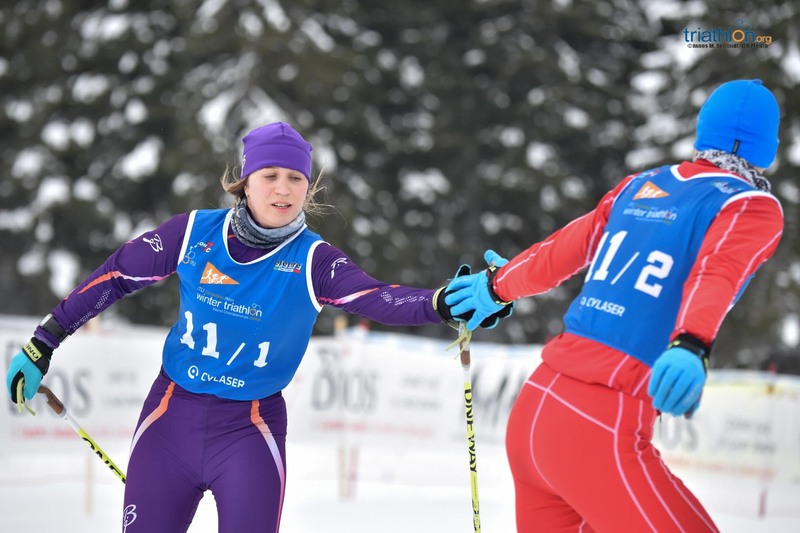 Behind her, Surikova and Lapinova teamed up in a joint effort to catch up with the young Russian, but as soon as they were into the cross-country ski section, Rogozina proved that she is a fantastic skier, settling into a pace that was just impossible to follow and increasing the difference over Surikova lap by lap. 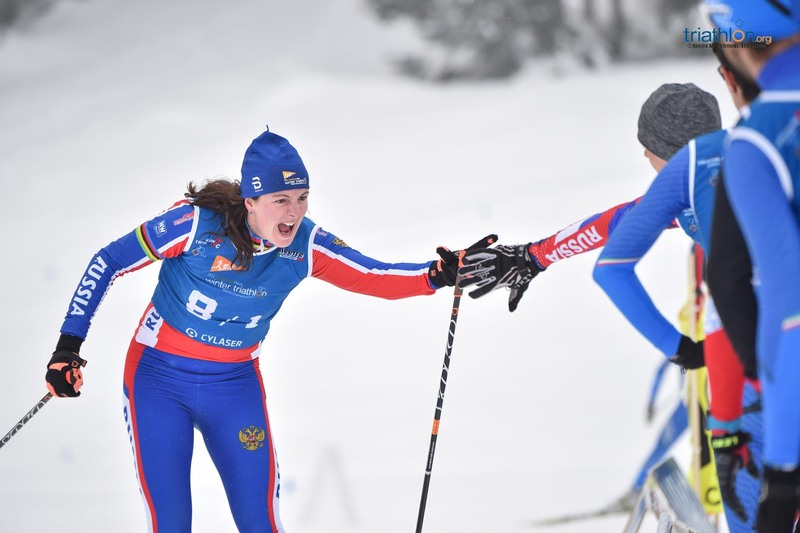 After the 12km on her skis, and wearing a huge smile, Rogozina crossed the finish line to claim both the Elite World Champion title and the U23 crown, proving that she has a great future ahead, not only in Winter triathlon - she was silver in the U23 Worlds last year and winner of the last Russian championship - but also in Cross Triathlon, where she finished in second place in the World Championships in Fyn. 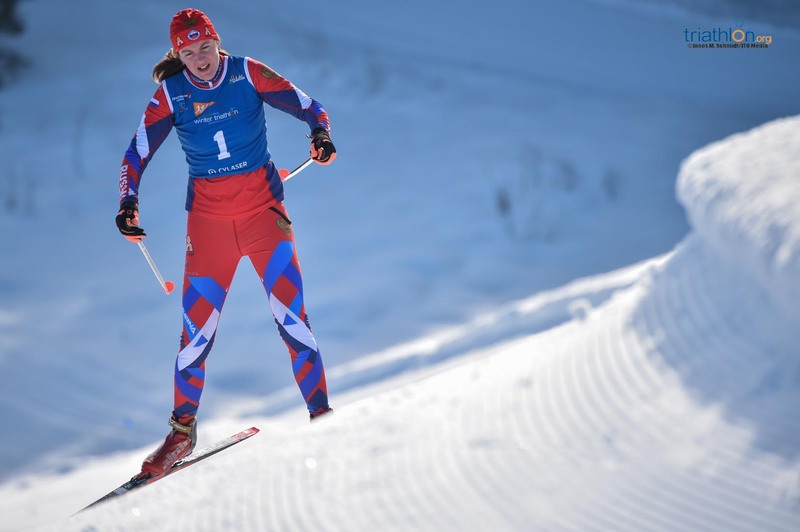 Almost four minutes behind her, Surikova stopped the clock on 01:44:35 to claim the silver medal while Romana Slavinec (AUS) ended up in the third place to claim, just as she did last year in the world championships in Cheile Gradistei, the bronze medal. 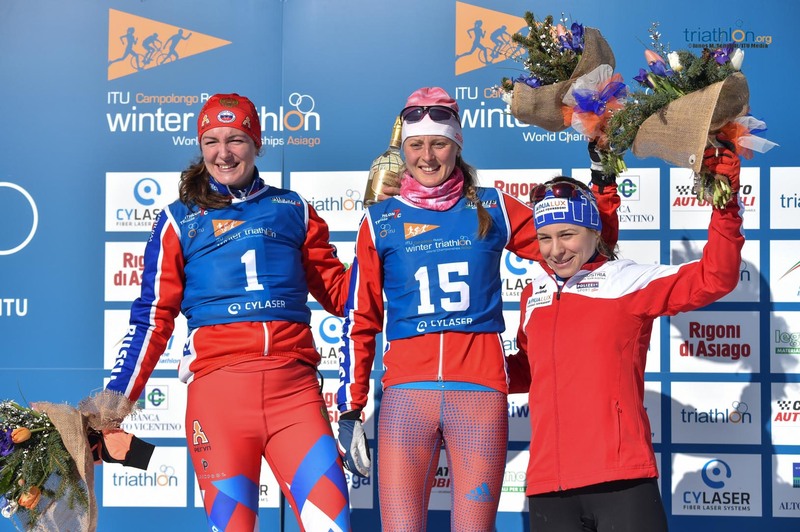 The U23 athletes proved to be strong enough to even beat some of the more experienced field, with Rogozina being the first U23 to cross the finish line and claim another world title followed by Belkina and Alexandra Levkovich, in a Russian podium sweep. 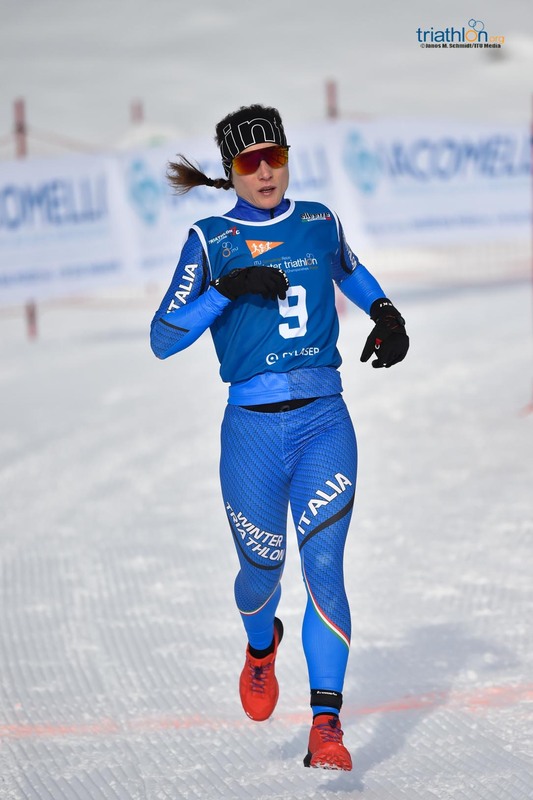 The Russian dominance was not so strong in the Female Junior race, where a local athlete, Giorgia Rogini (ITA), born and raised in Asiago, made the day for the crowds that were supporting athletes all day to claim the World title in style, with a superb performance in the ski course. 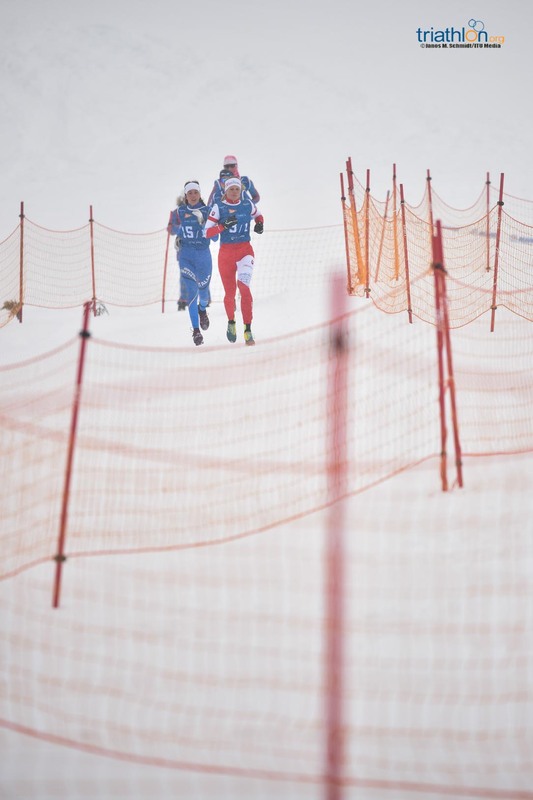 Behind her in the finish line were Zuzana Michalickova (SVK) and Aleksandra Tetiueva (RUS). 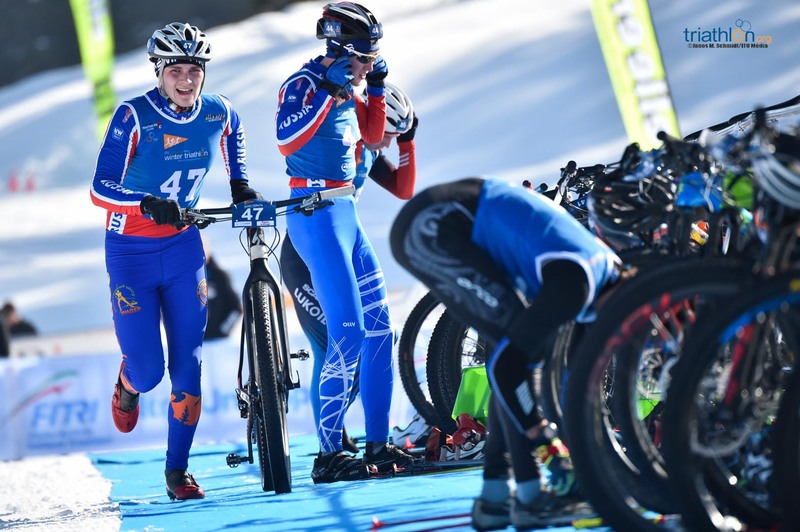 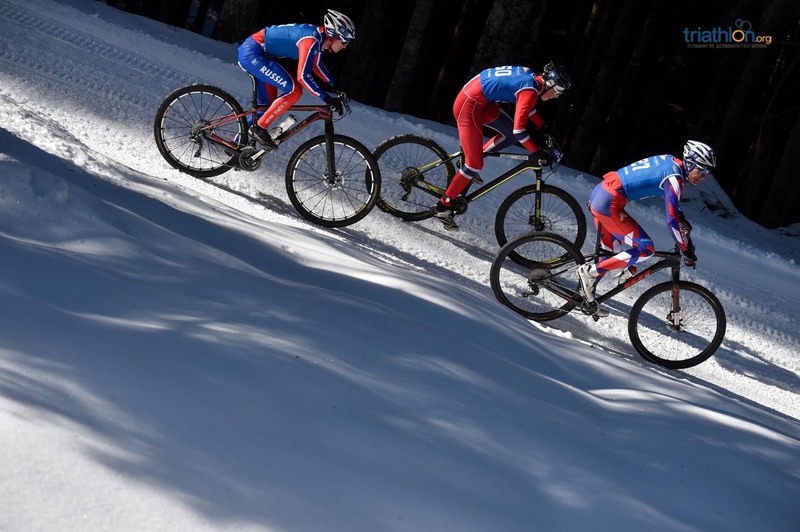 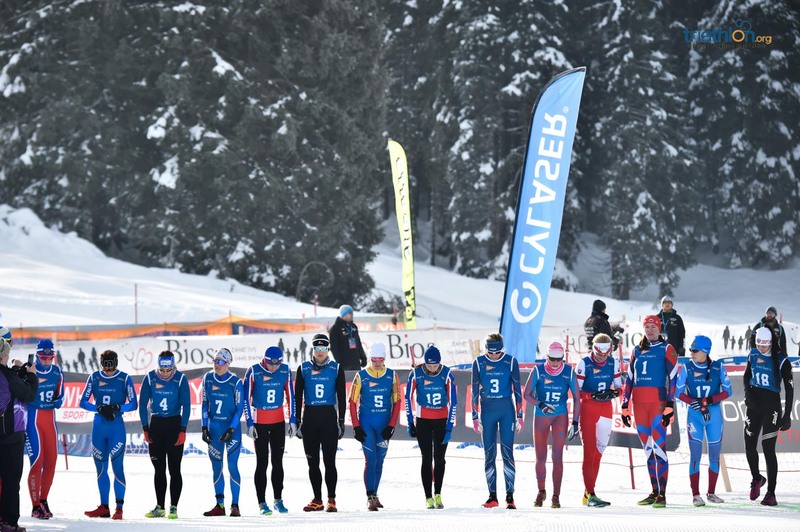 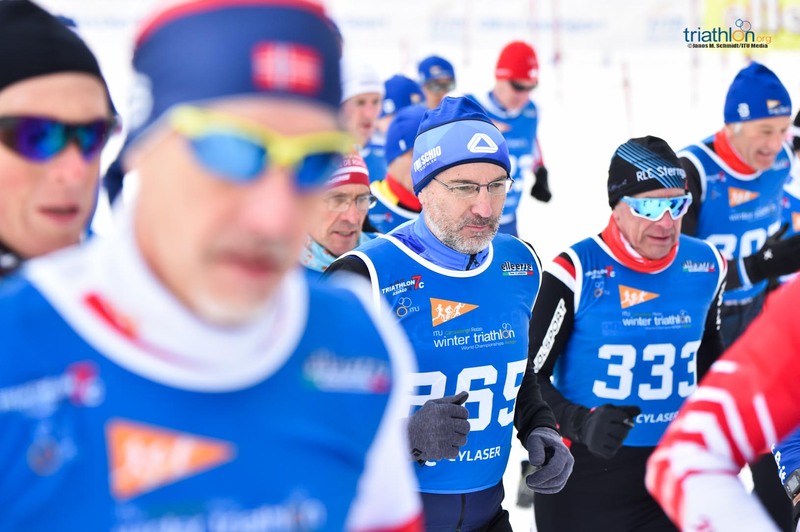 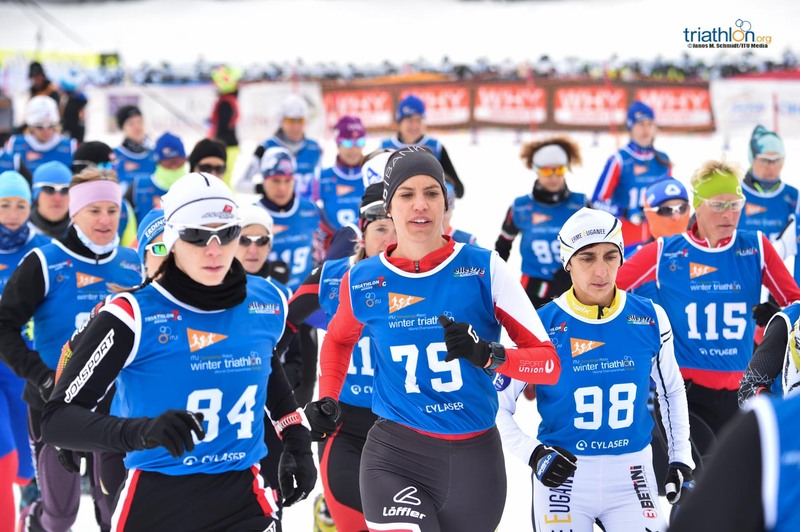 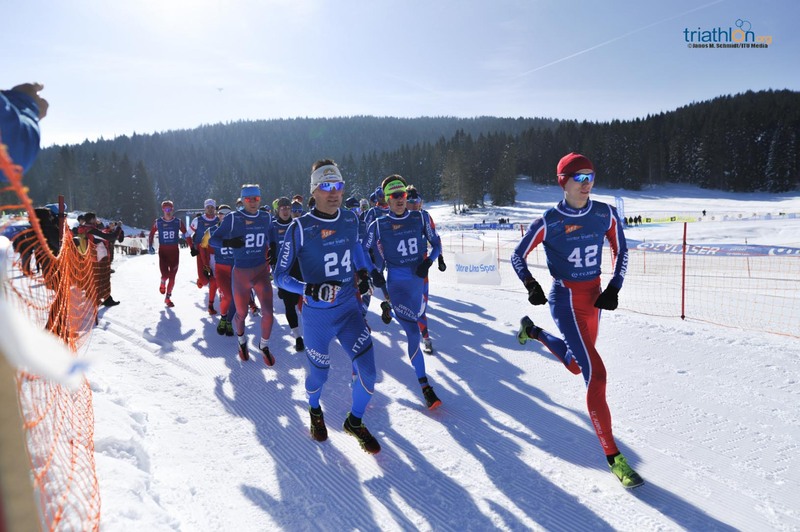 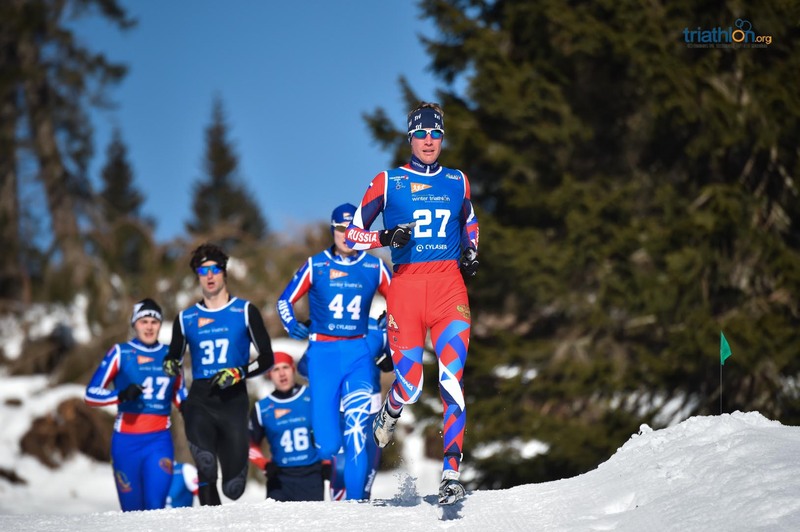 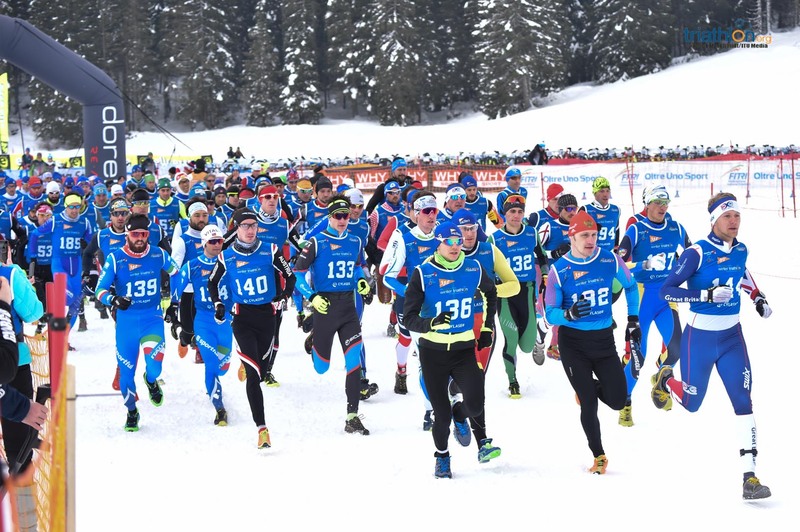 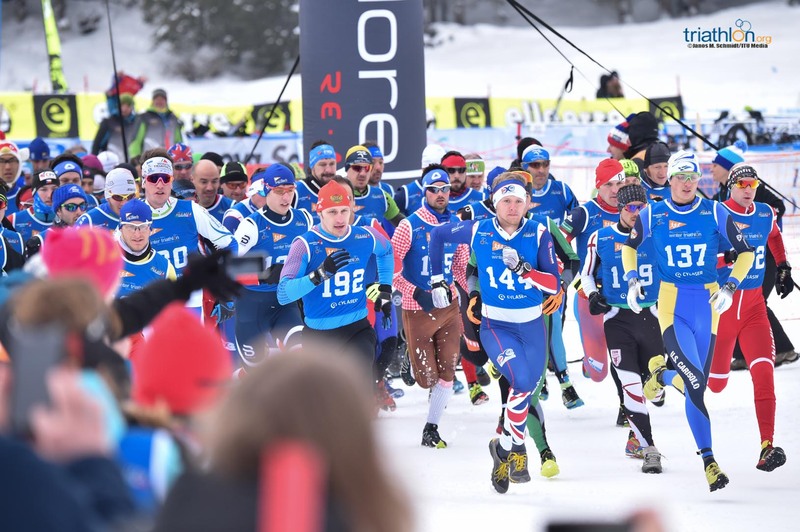 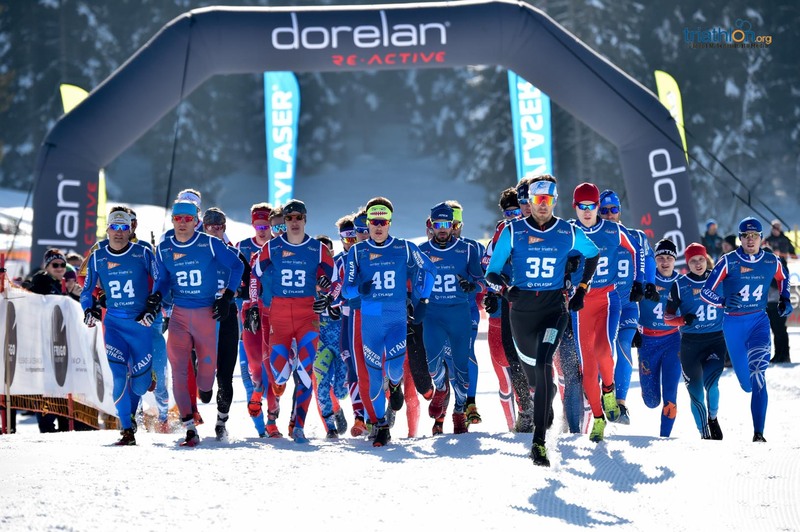 The sun was out for the 50 men starting the Elite and U23 race in Asiago, and it was clear from the beginning that the race was going to be a hard battle between the Russians and the local hosts, the Italian squadra tricolore. 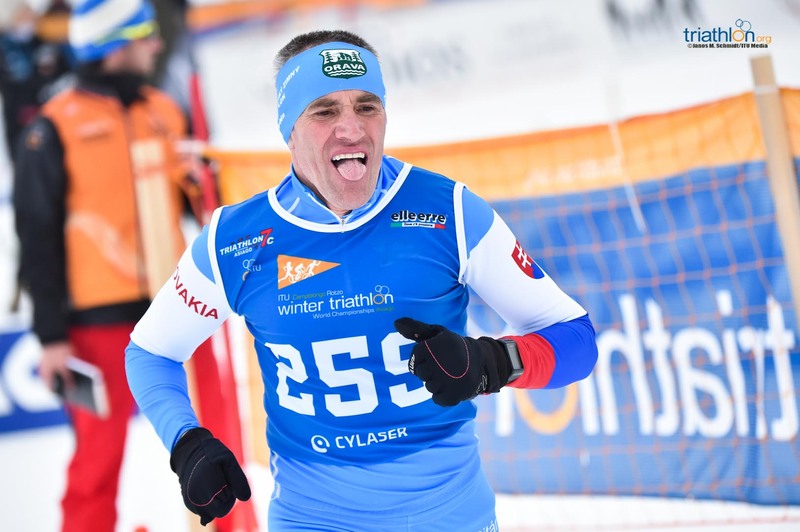 So right after the horn that marked the start of the race, another local athlete, Franco Pesavento, took the lead to try to open a gap. 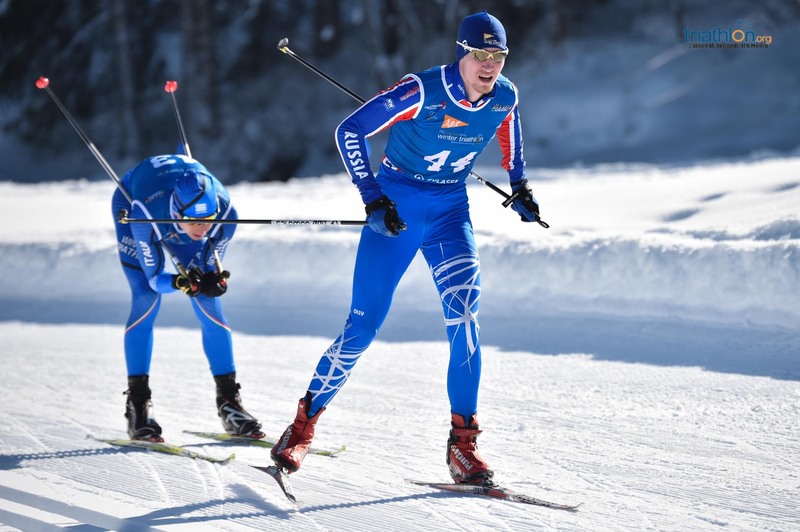 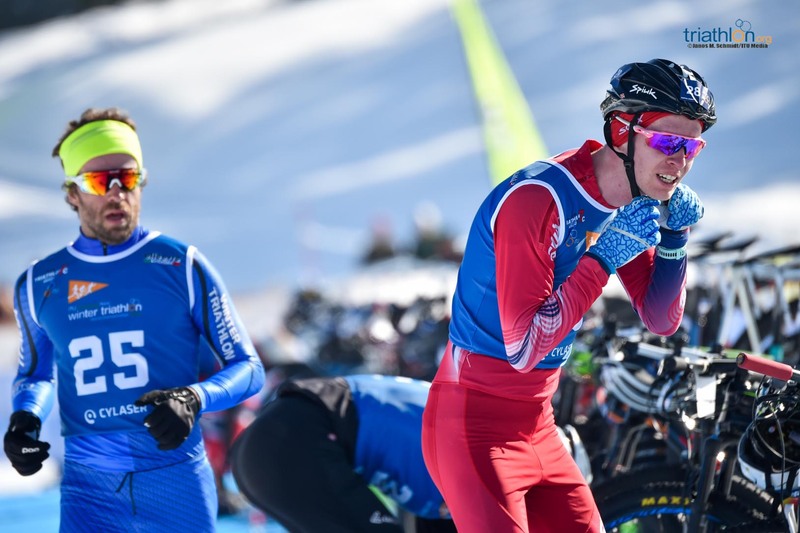 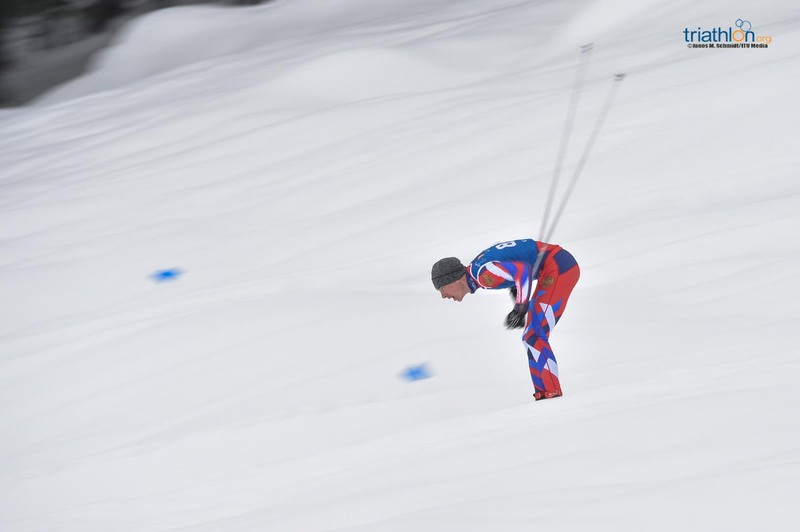 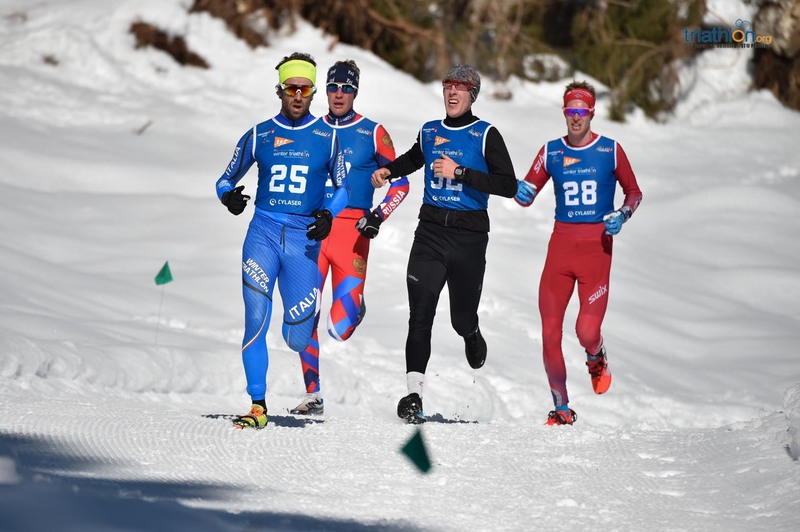 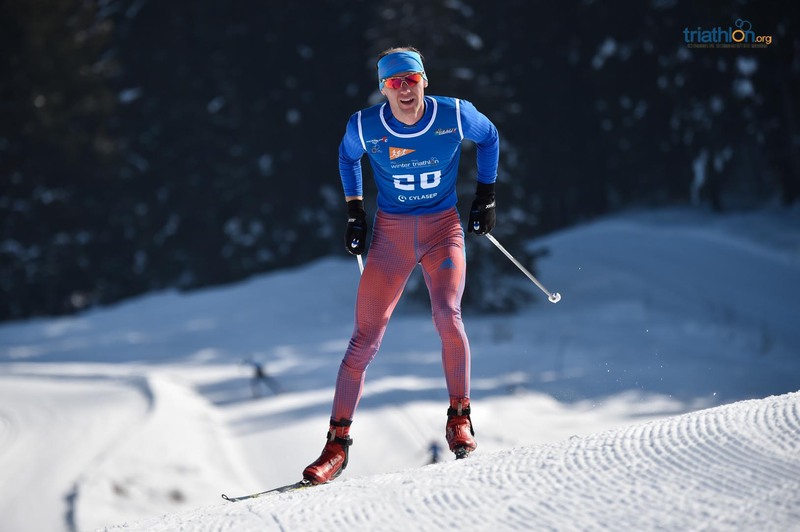 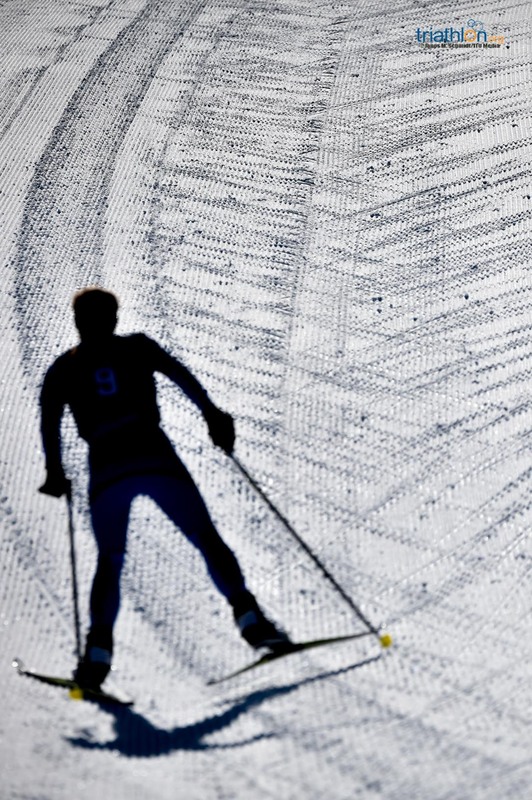 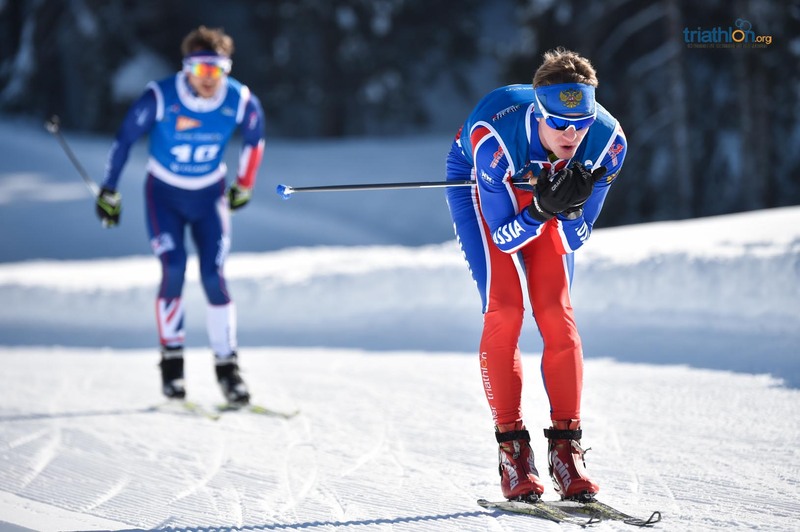 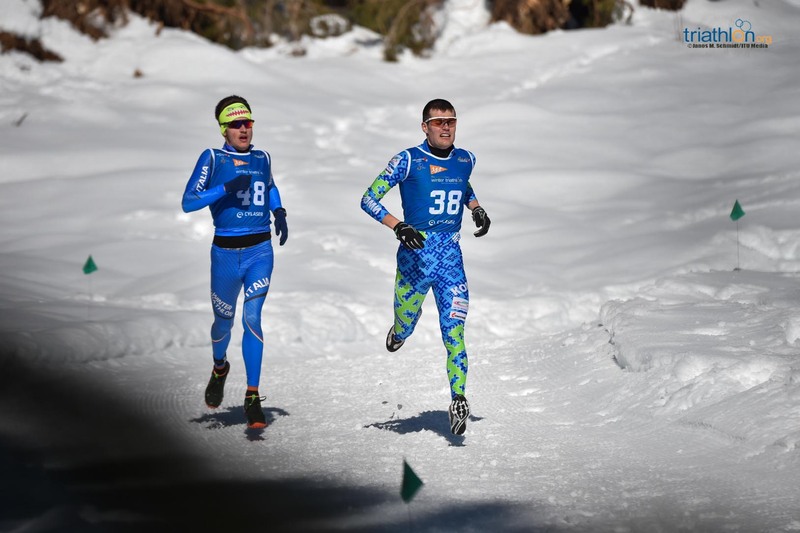 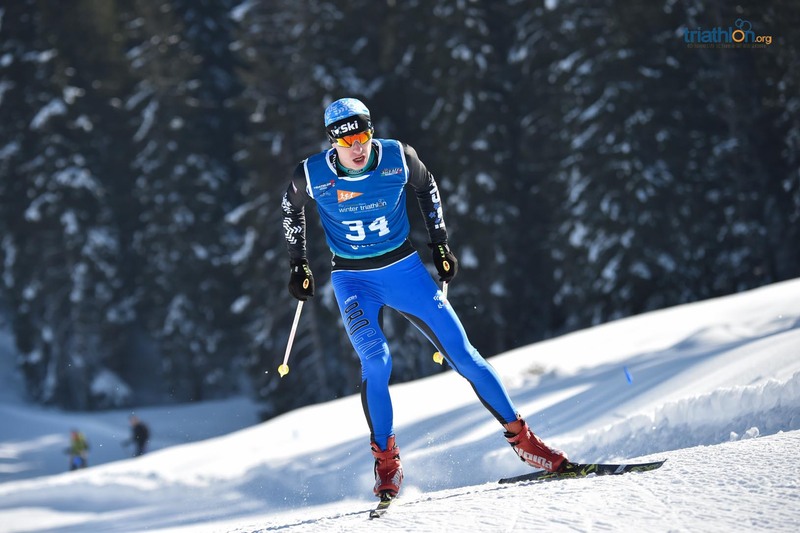 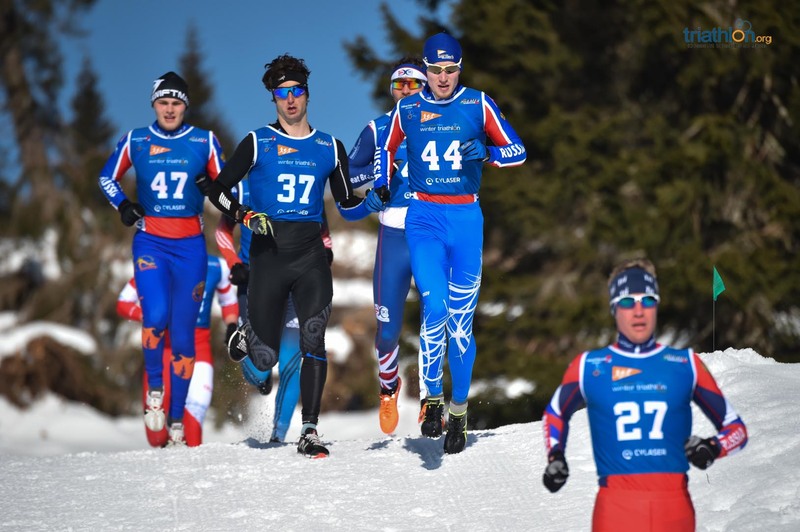 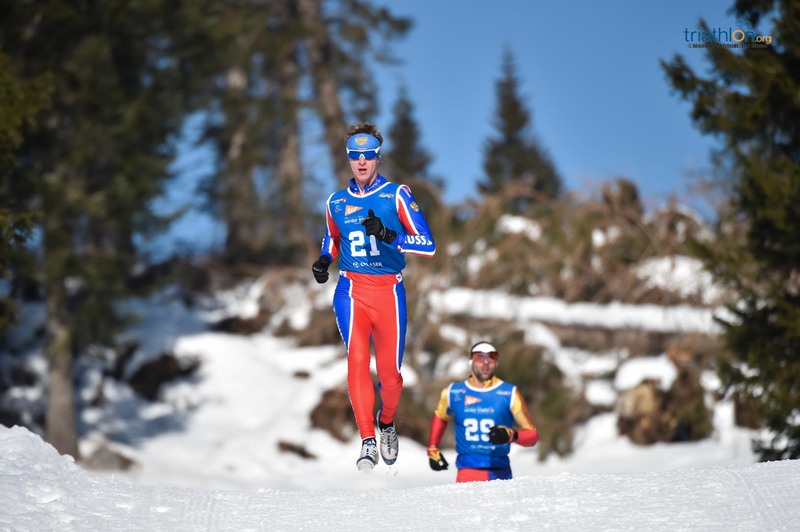 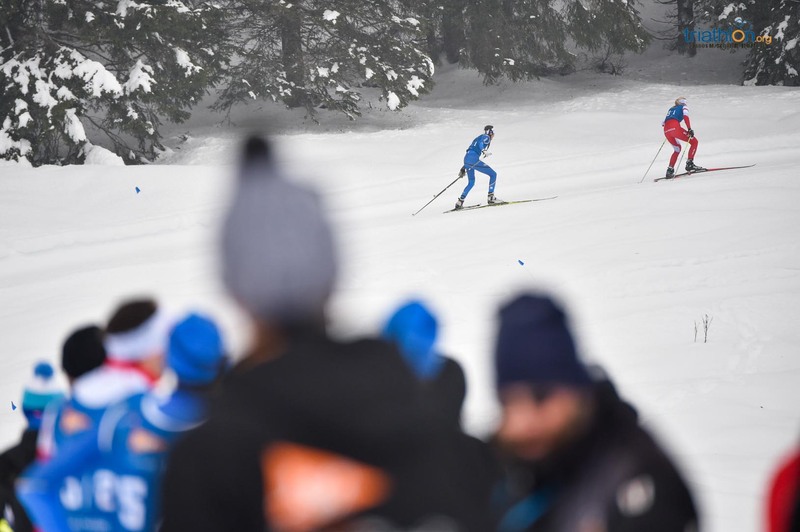 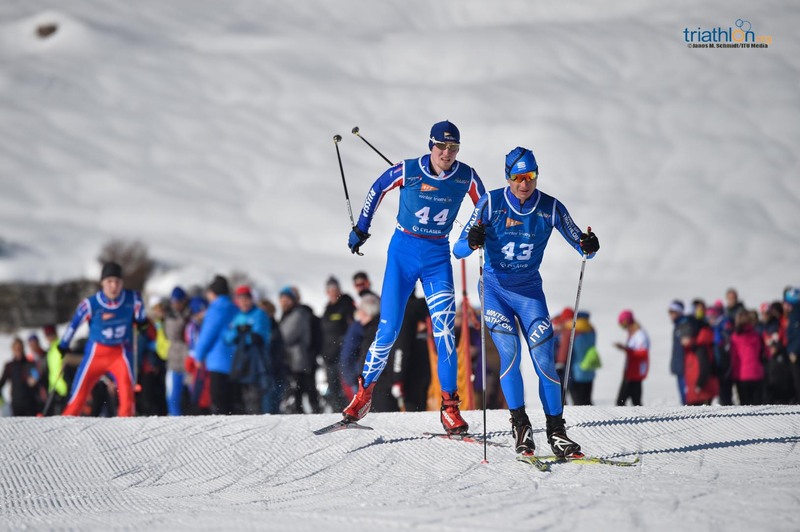 Knowing the course by heart, he was quickly followed by his teammate, Daniel Antonioli, as well as Christoph Schlagbauer (AUT), Evgenii Uliashev (RUS) and Dmitriy Bregeda (RUS). 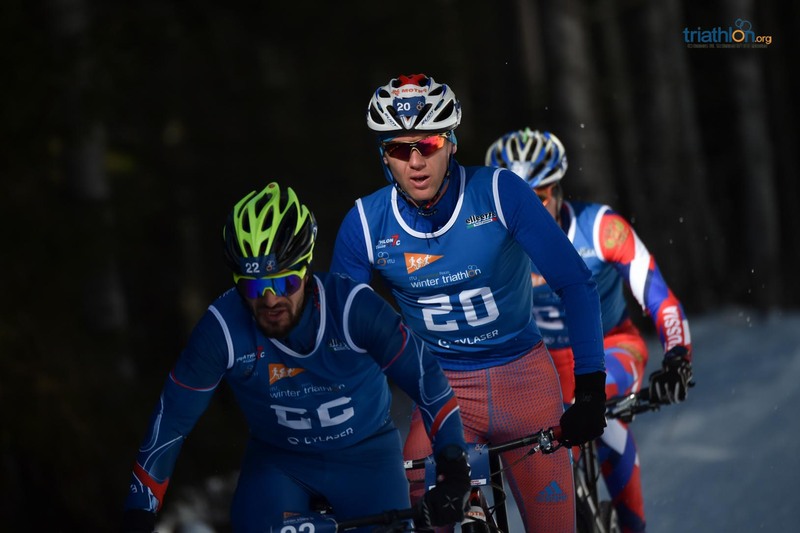 Meanwhile, the one to beat, six-time world champion, Andreev, seated comfortably behind them, keeping the distance under control but without making too many efforts, knowing that the hard part will come later. 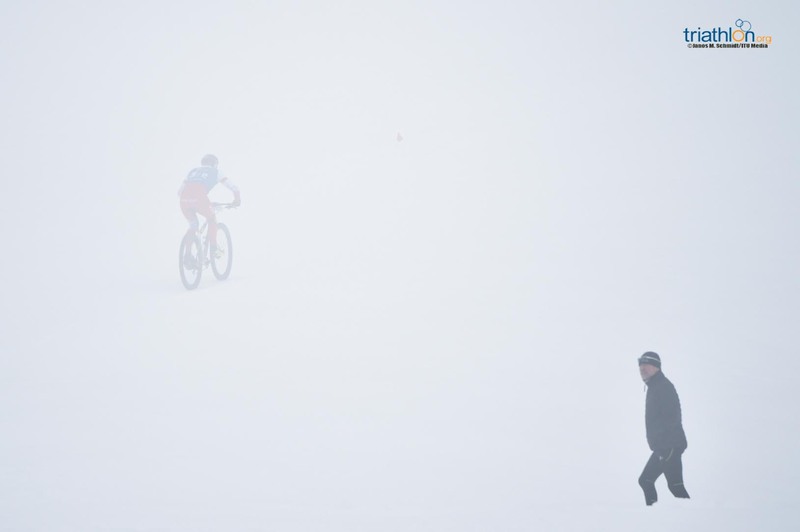 And indeed it came. 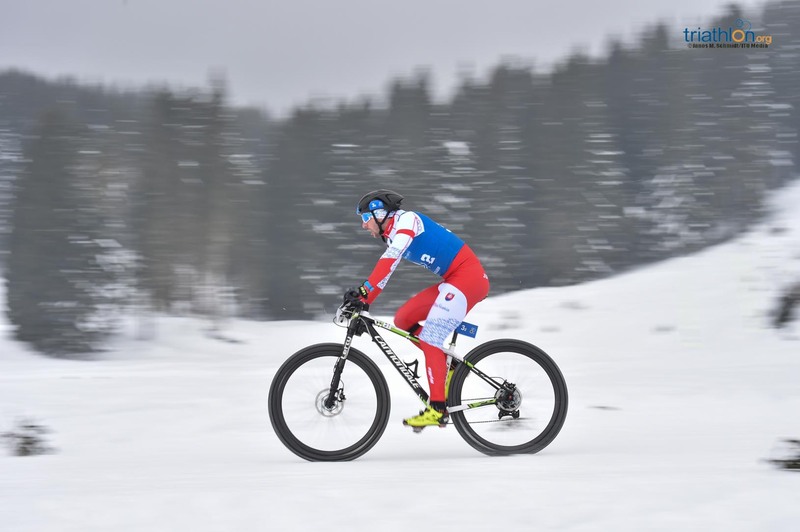 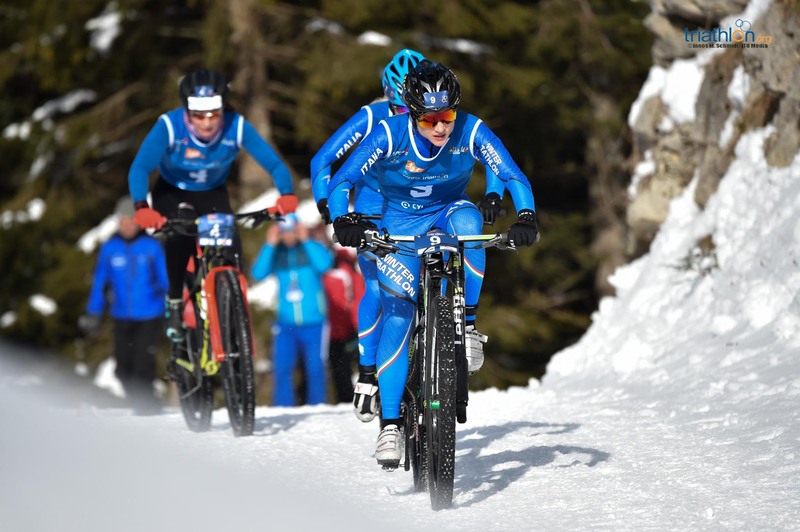 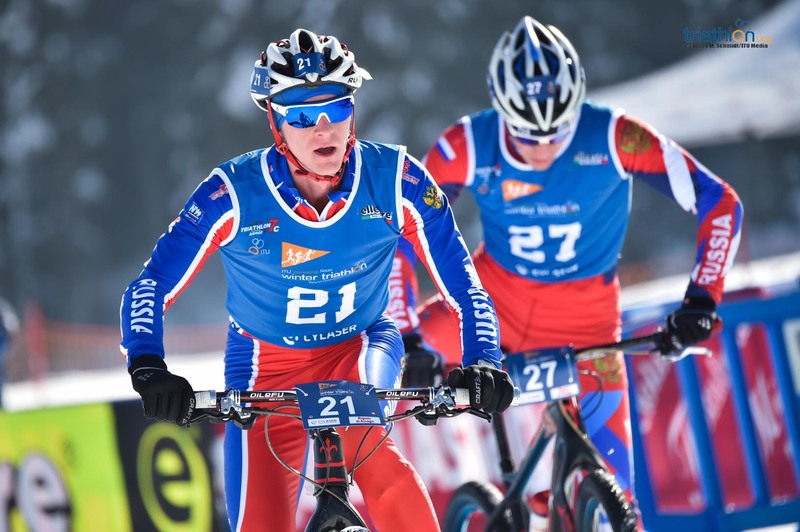 As soon as the men were in the bike course, Andreev showed his dominance and bike skills in the hard conditions in Asiago to chase the leaders one by one, leaving all of them behind as the laps passed by. 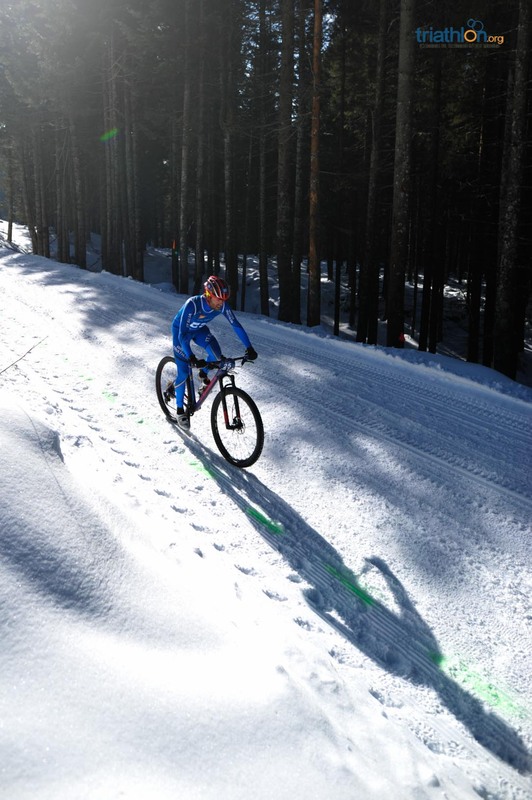 By the end of the four laps in the bike course, he was already leading the race. 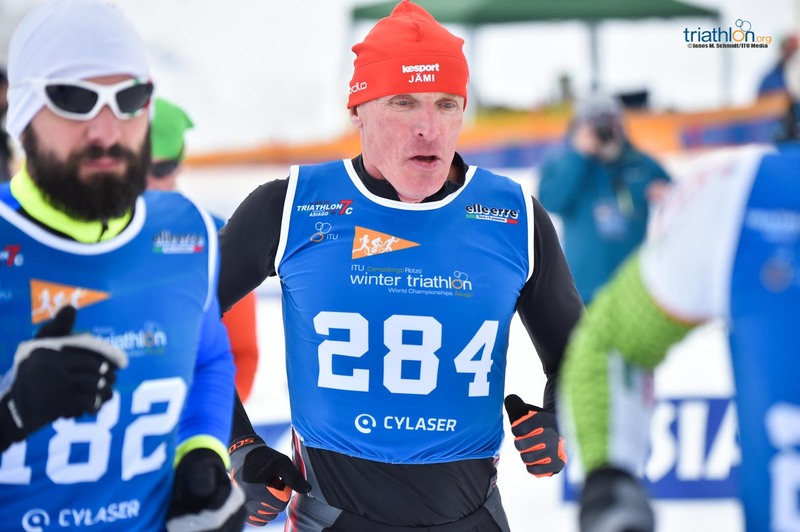 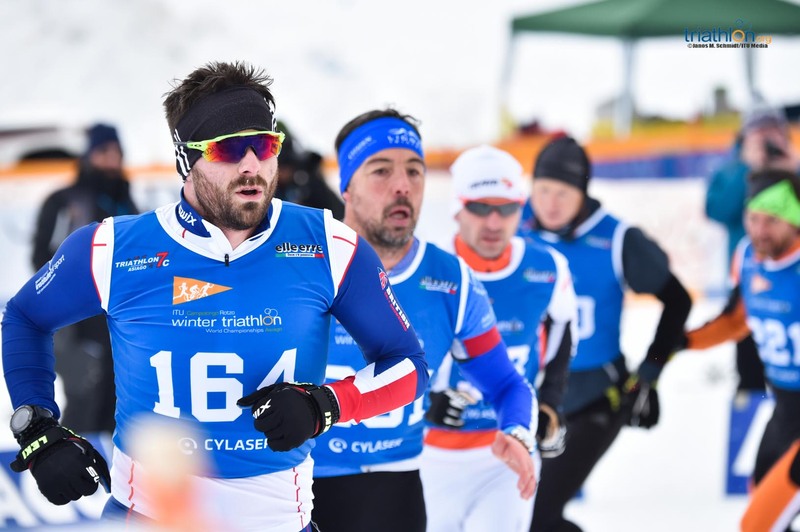 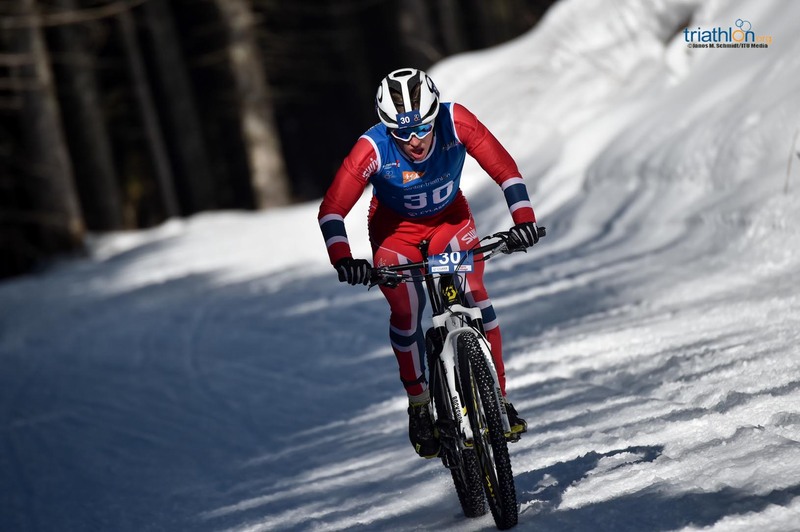 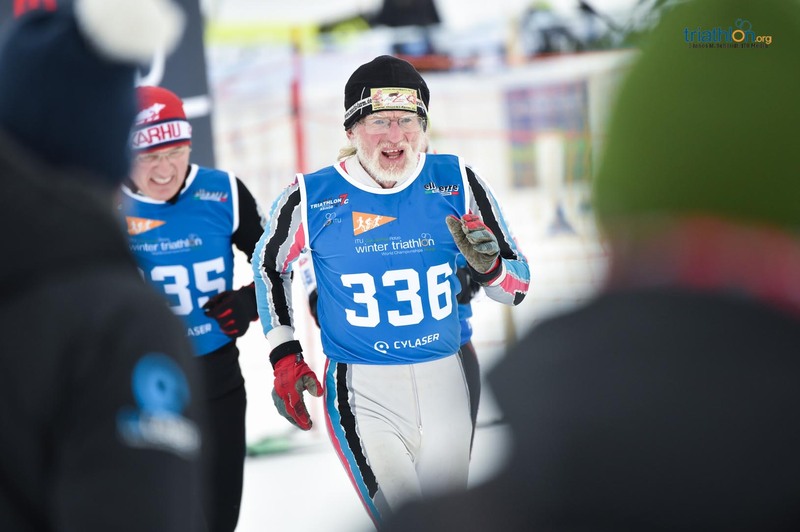 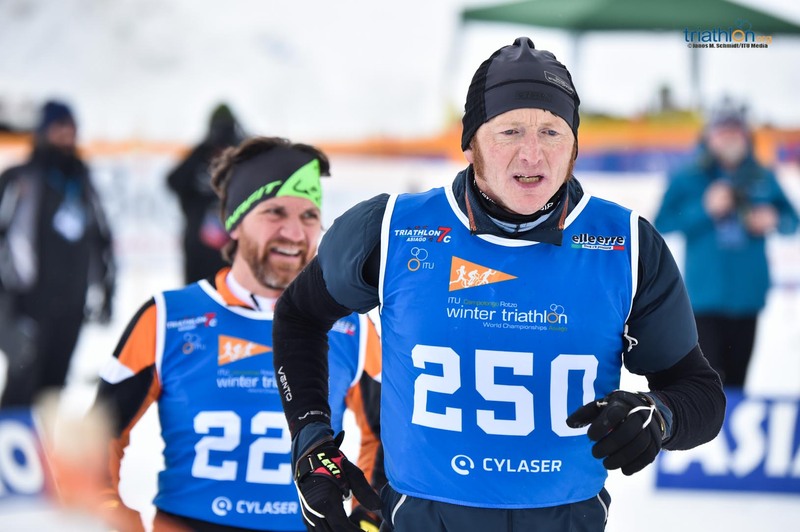 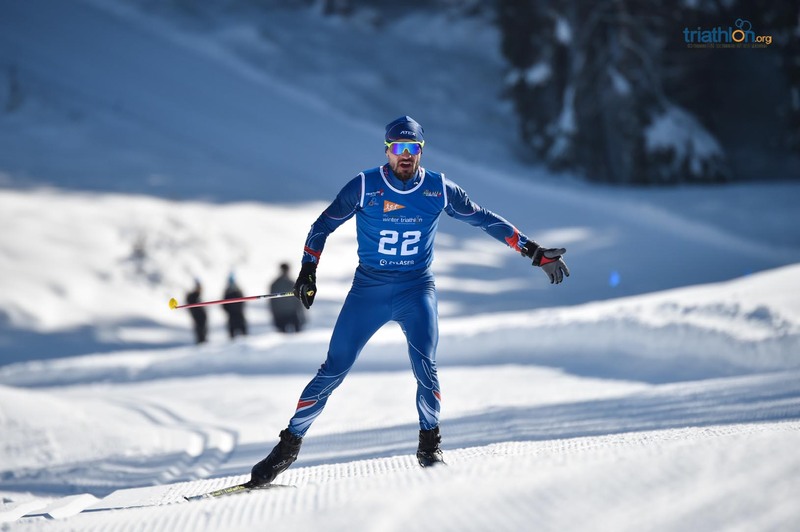 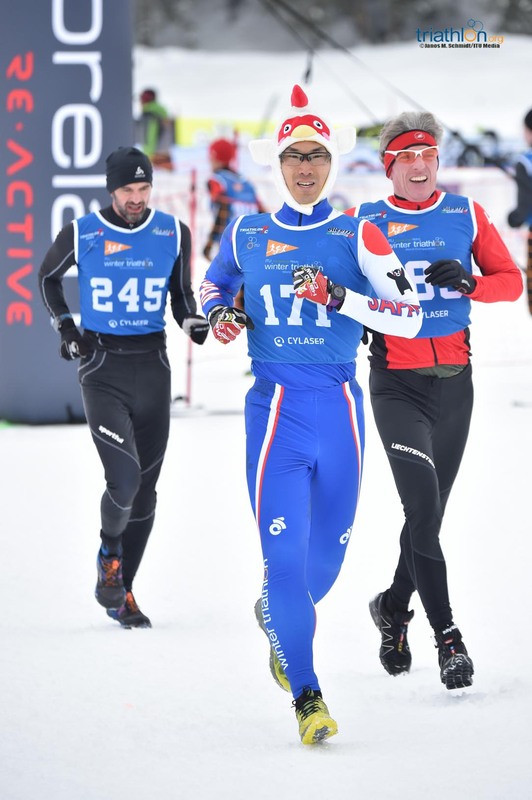 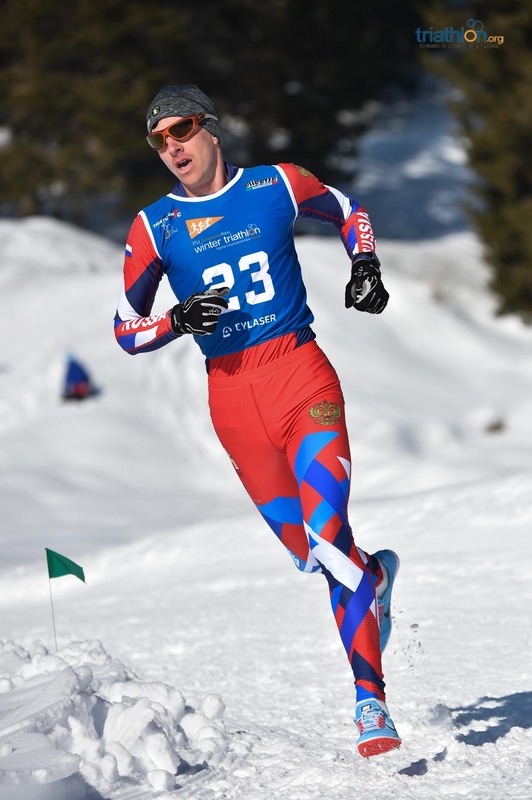 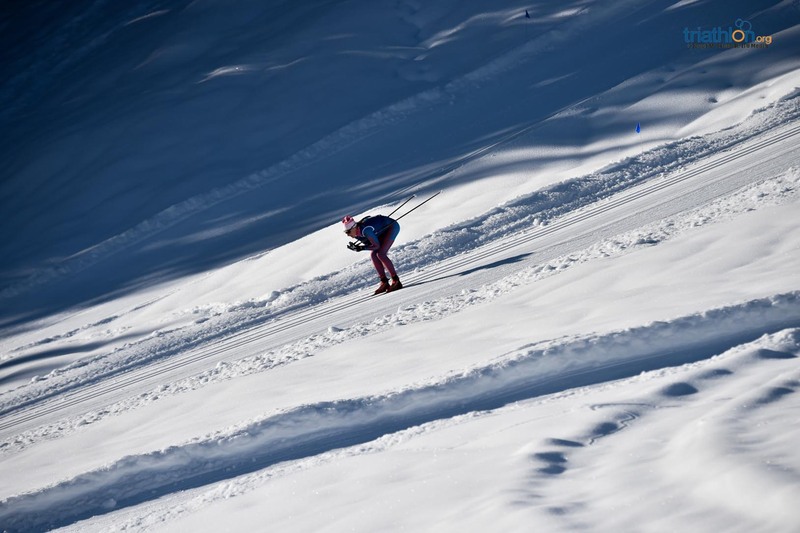 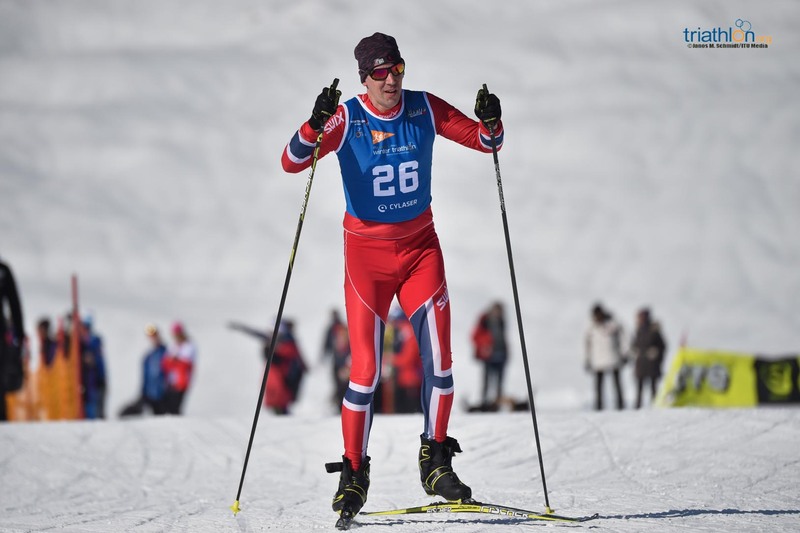 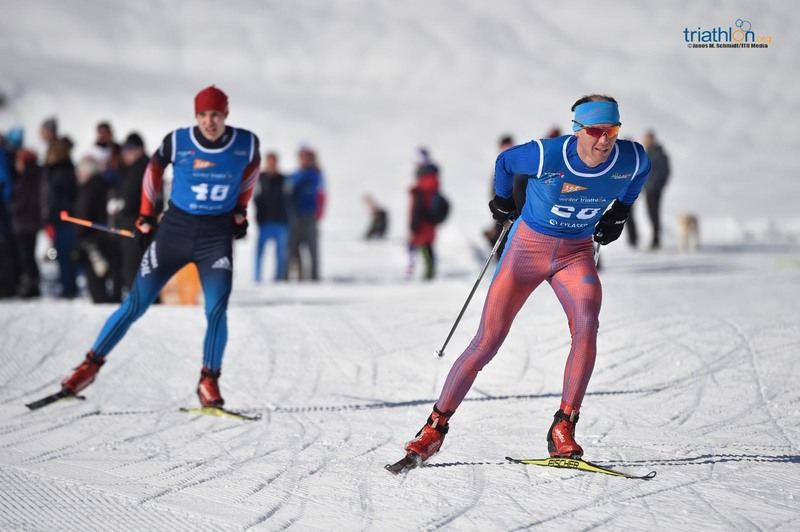 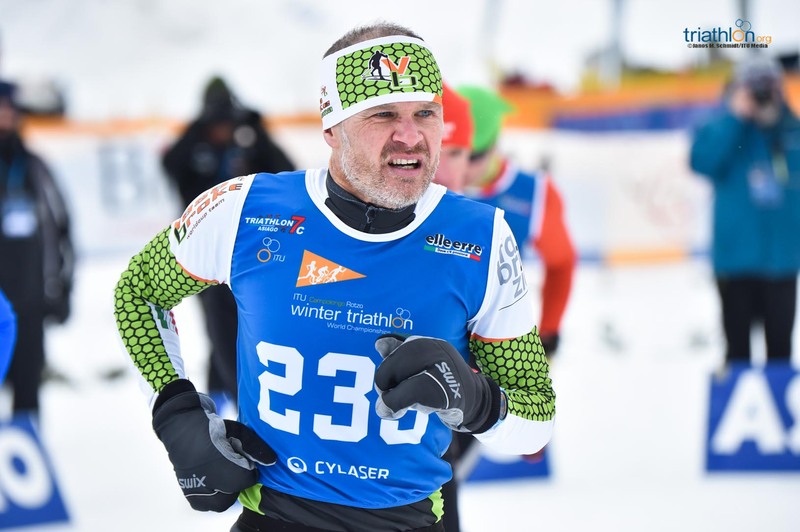 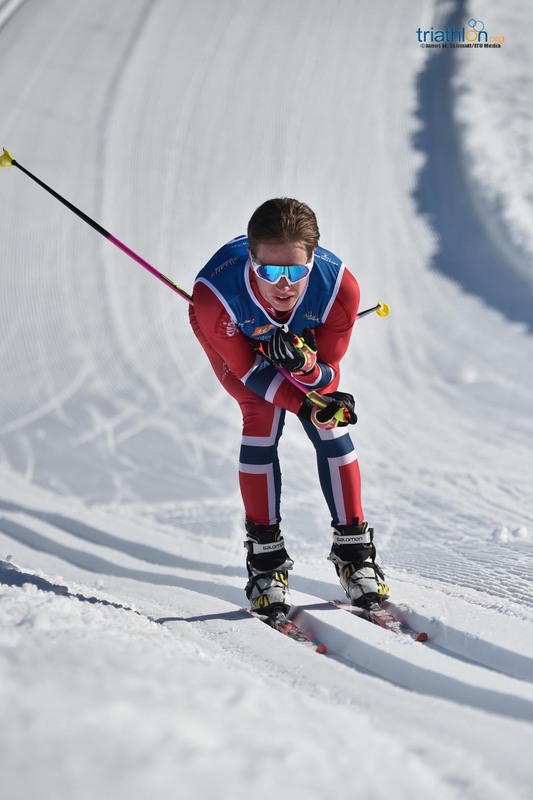 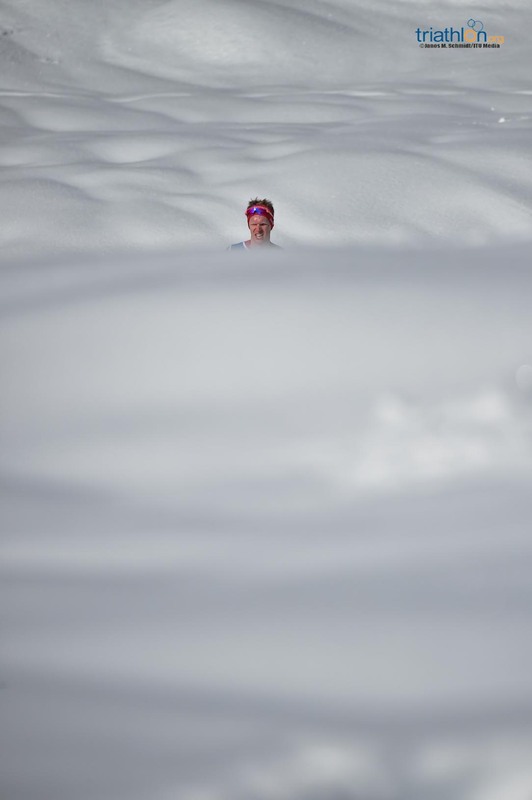 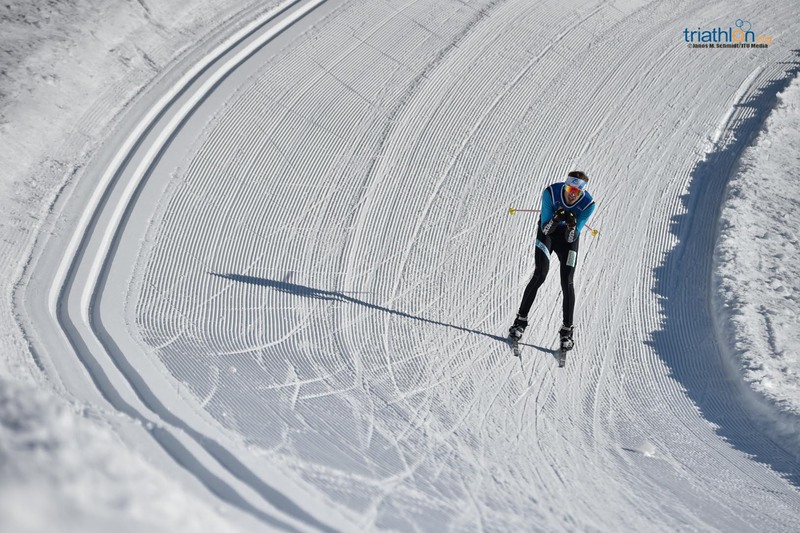 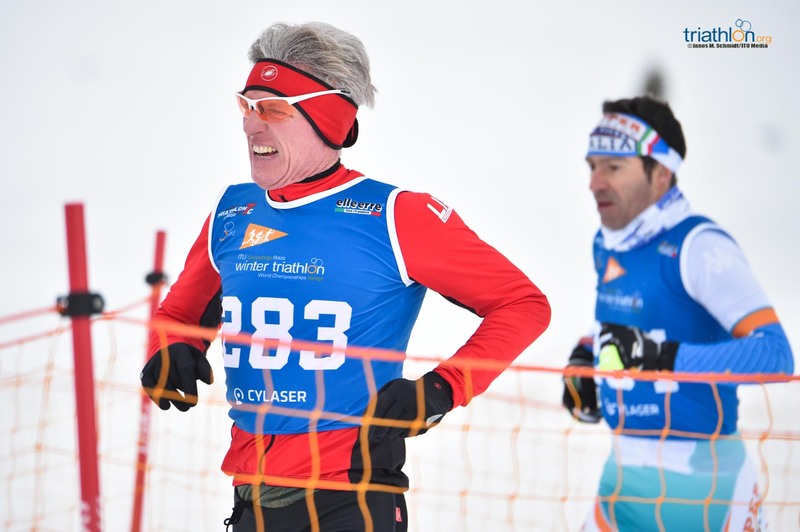 And knowing that he is most likely the most complete athlete in the field, he kept pushing and pushing in the first kilometres of the ski course as well, increasing the distance in another solo performance. 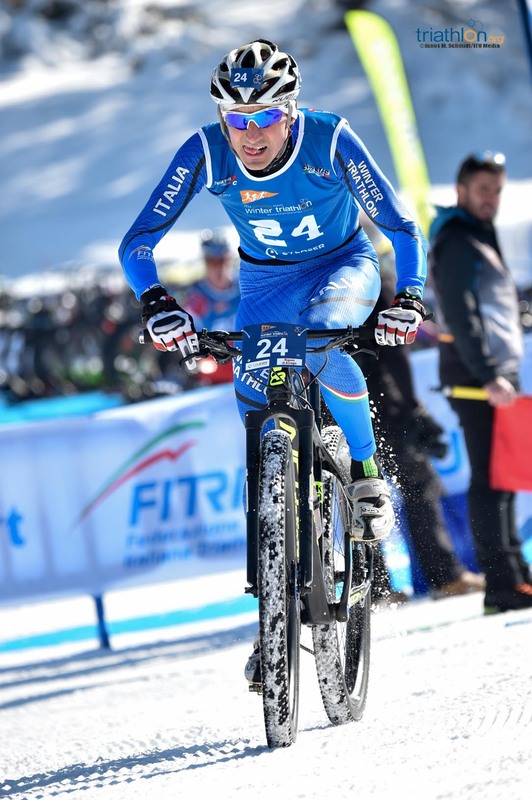 It was enough to have him claiming the seventh World Title of his career. 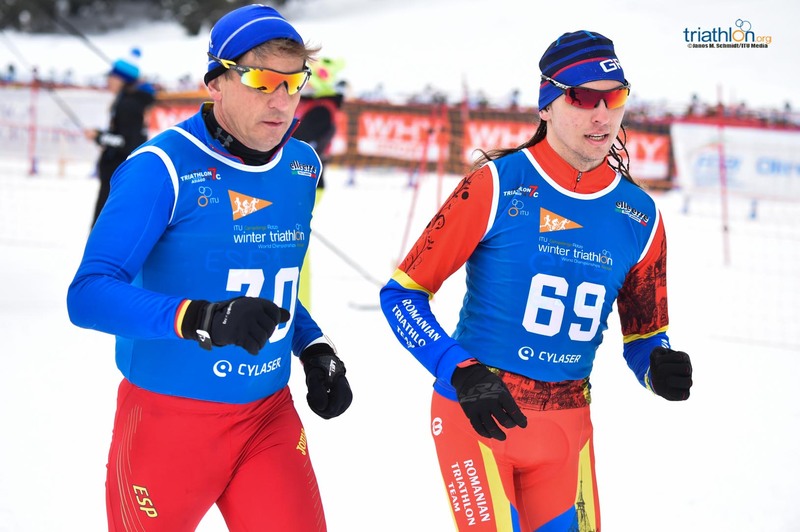 Only his teammate, Bregeda, looked able to keep up with the pace, but he only managed to open the gap behind him and secure a silver medal that meant a great deal for the Russian, seventh in the previous World Championships even though Andreev considers him the “most difficult man to beat out in the course”. 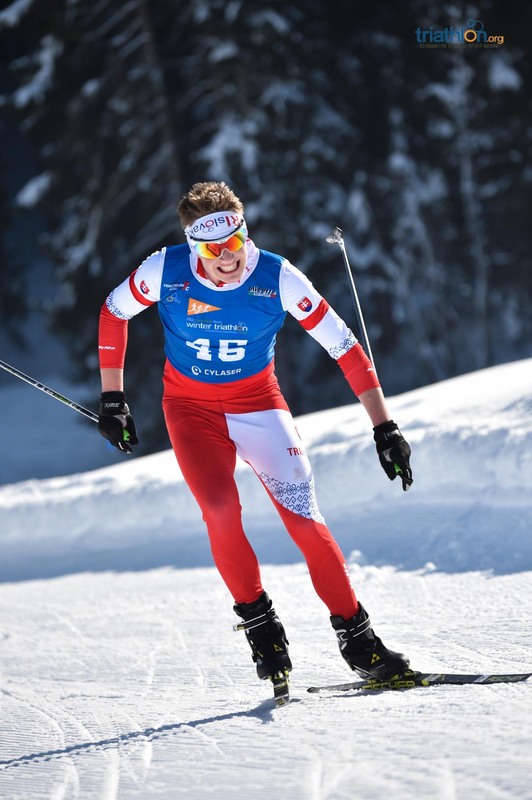 The bronze medal was for Marek Rauchfuss (CZE) after another splendid ski leg, repeating the position he got last year in the world championships. 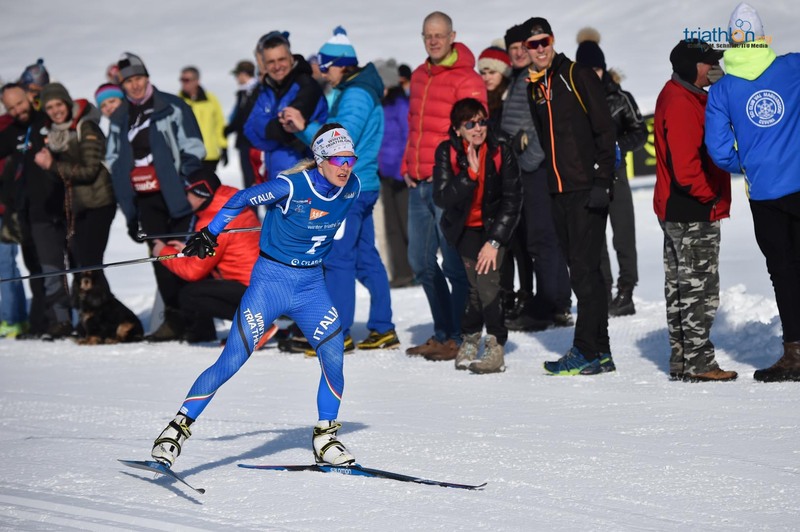 And the biggest ovation of the day was, indeed, for Antonioli, who fought hard to try to perform as he had dreamed in Asiago but only managed to cross the line in the fifth place. 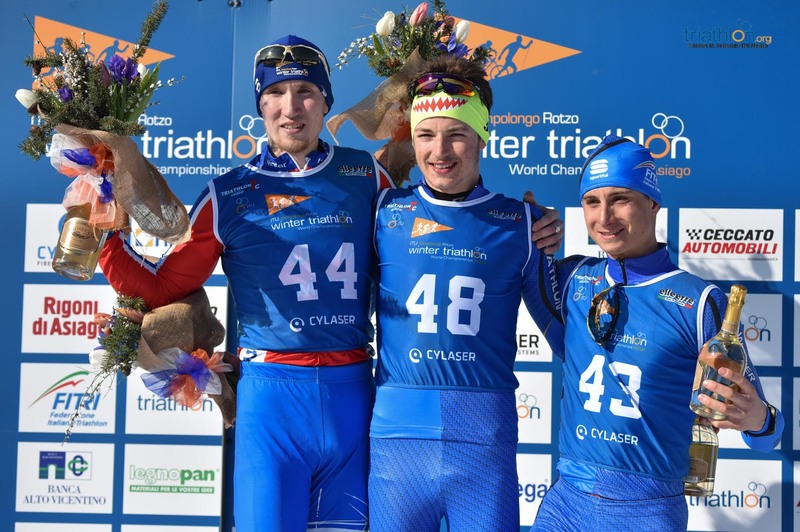 The sweetest moment for the crowds came in the U23 category, where local hero Franco Pesavento (ITA) claimed the gold medal and teammate Alessandro Saravalle (ITA) the bronze, Russian Aleksandr Vasilev earning the silver. 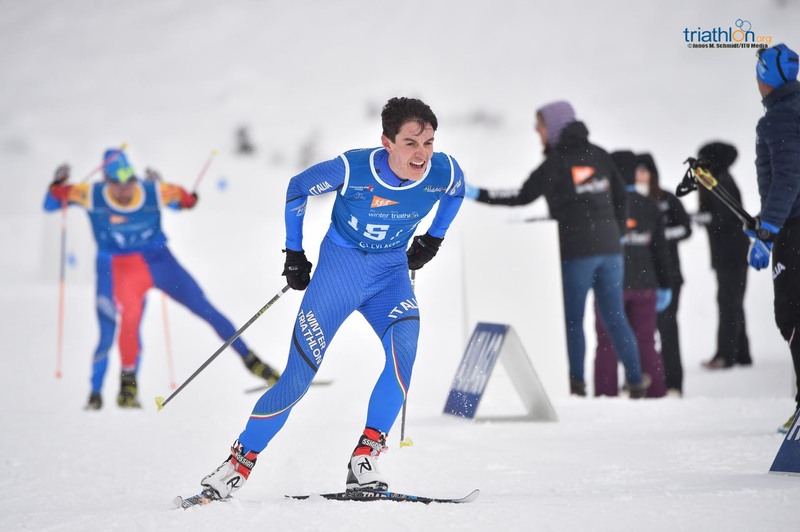 It was also a great day for Italy in the Junior race, where Simone Avondetto (ITA) claimed the gold medal, followed by Vladislav Semenov (RUS) and Oleg Morozov (RUS).